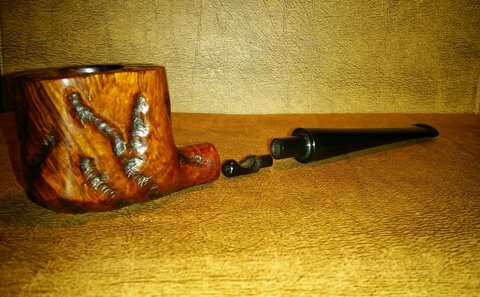 Scrap briar or not I still enjoy the look of Mr.Dobbs pipes. 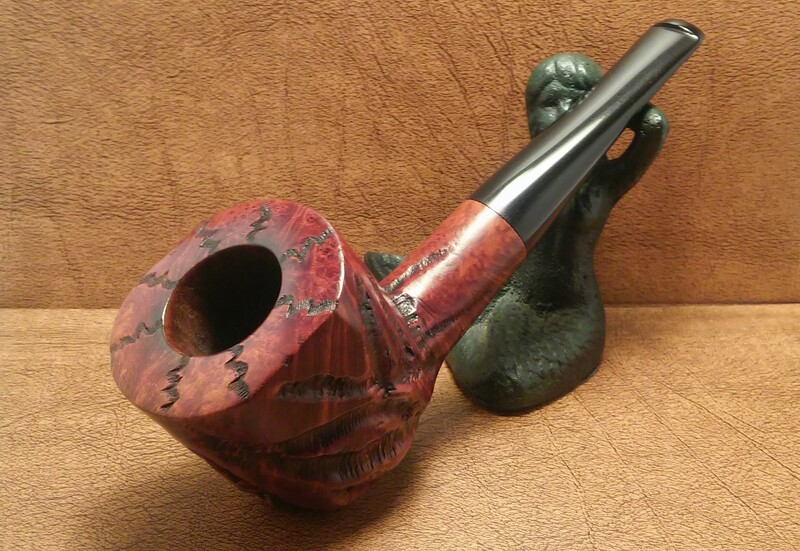 Deeply carved and chunky. 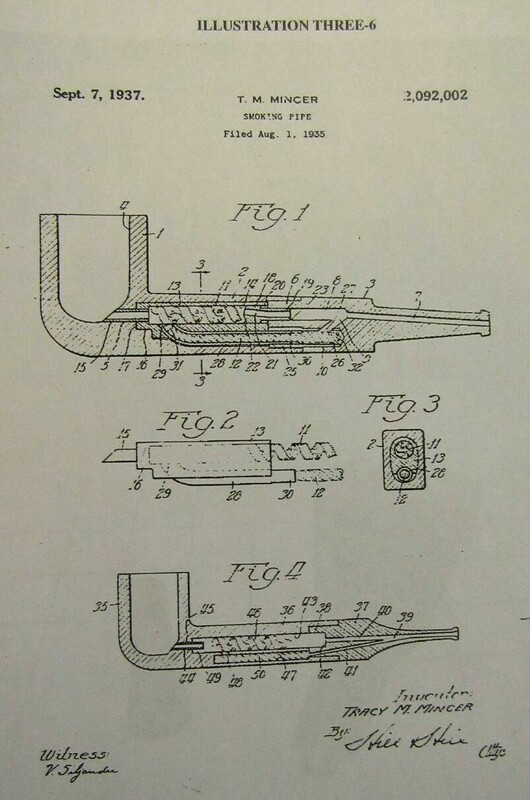 There’s no mistaking who made this line of pipes. 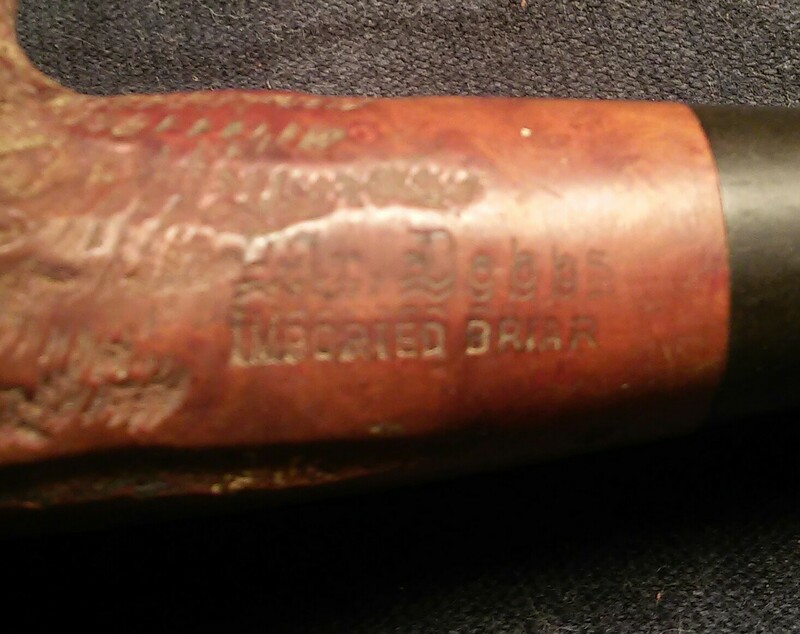 Well loved Mr.Dobbs has been sitting in a box for some time now. 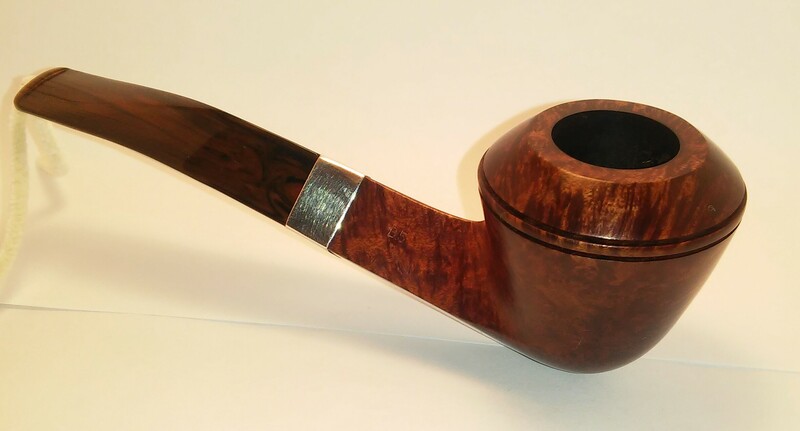 Made in the 1950s using scrap briar and sold at reasonable price for the average joe, it has all the look and feel of a Custombilt with the exception of the briar quality. 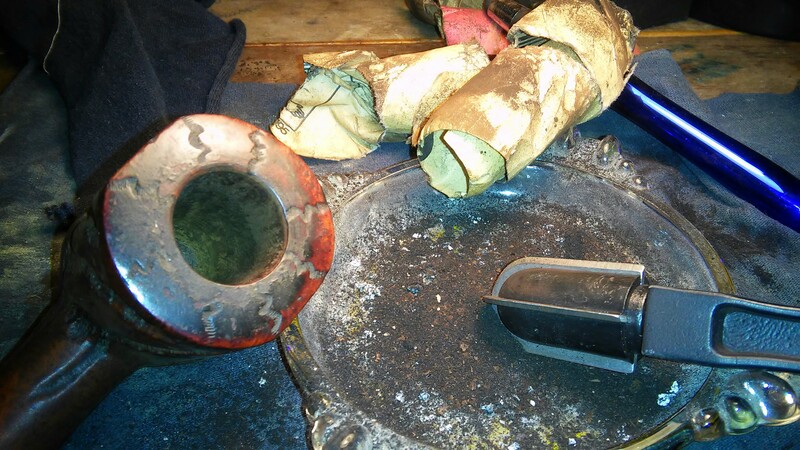 There were many imperfections most notably the top of the bowl. 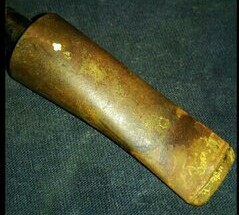 It had a thick cake, worn button and what I think is paint or maybe spackle spread across the exterior of the pipe. 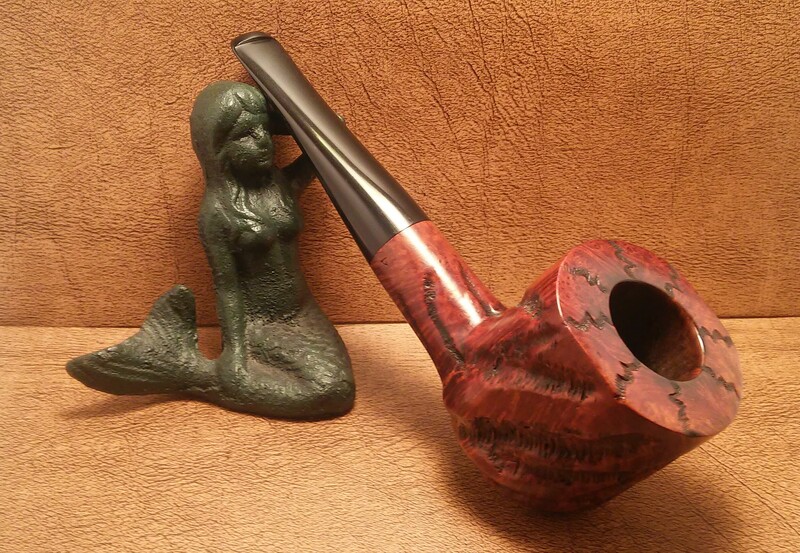 I received this pipe in a lot a few months ago among other Custombilt lines . I began with the chamber and my Castleford reamer, starting with the smallest and working up to the largest. 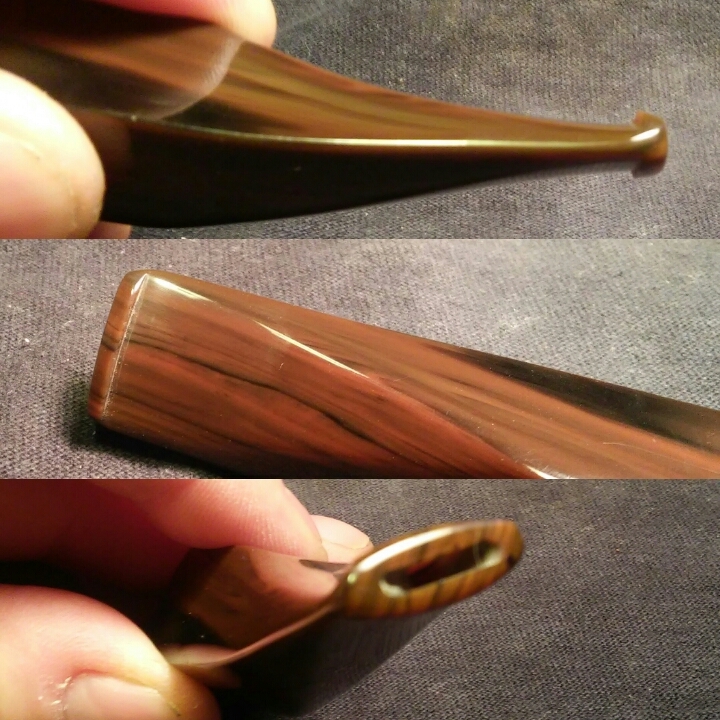 Finishing with 400 grit paper wrapped around a finger. 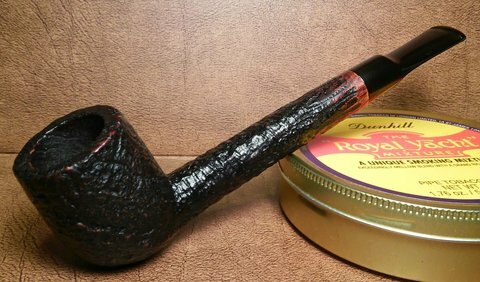 With the chamber reamed I moved to the rim. The rim was heavily caked with spots of paint mixed in. 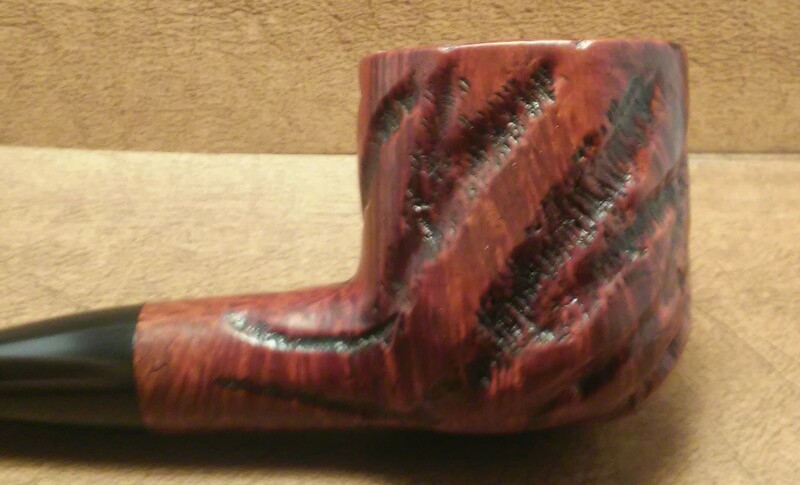 I applied Method wood for good polish to the rim and left it aside to soak. After soaking for 20 min I used a toothbrush to break up some of the residue, I would have to repeat this process a few times and move to Q-tips, make-up pads and a pick to complete it. 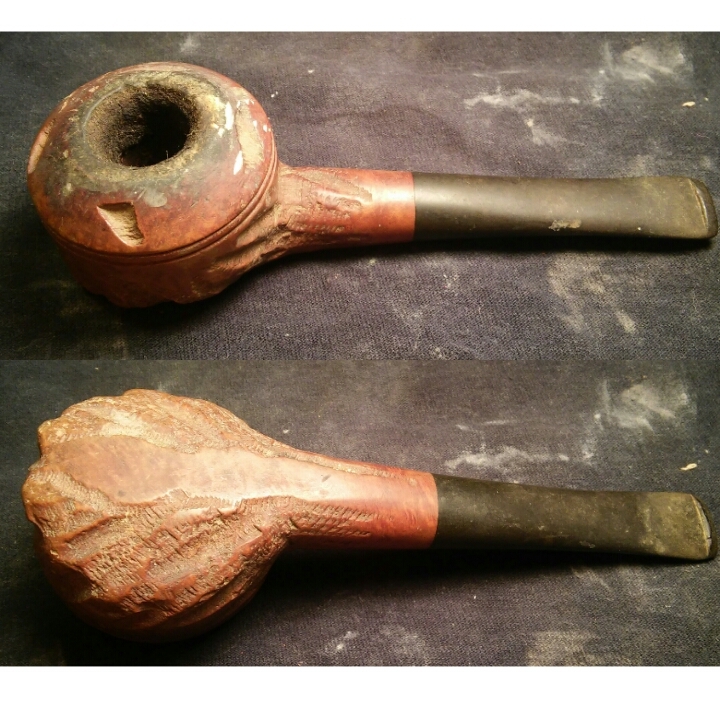 At this time I cleaned the exterior of the pipe as well with the wood polish,toothbrush and make-up pads. 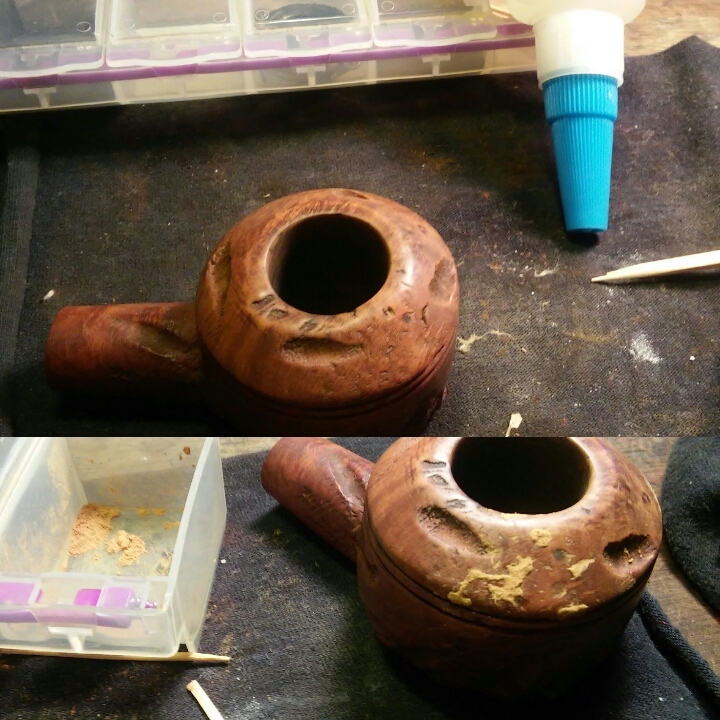 I used a pick to clean the paint and debris out of the carving of the bowl. 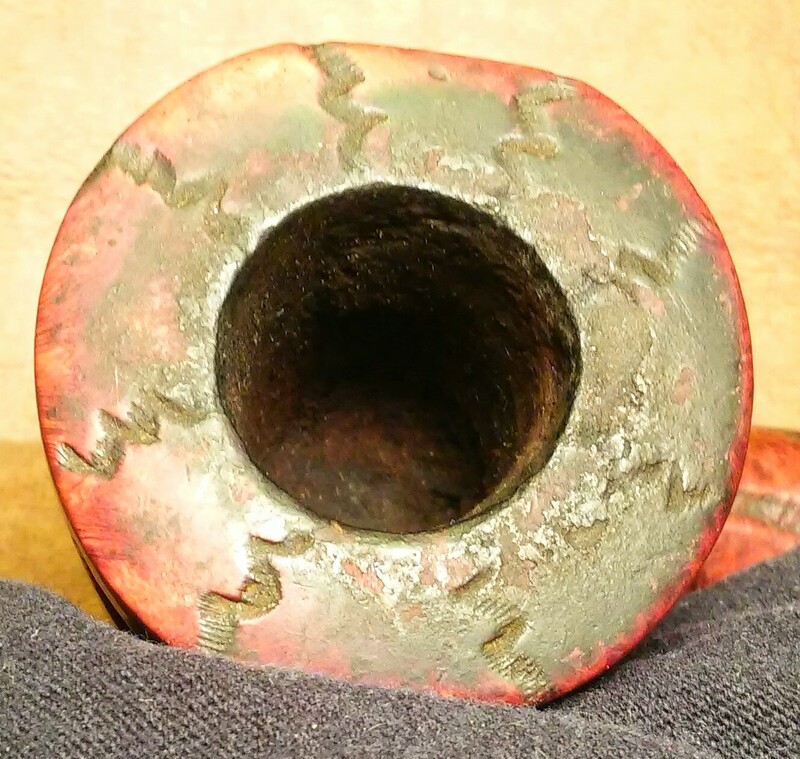 The right side of the bowl and bulldog ring had spots where someone may have smacked the bowl against a hard surface to empty the chamber. I first attempted steaming out some of the dents. 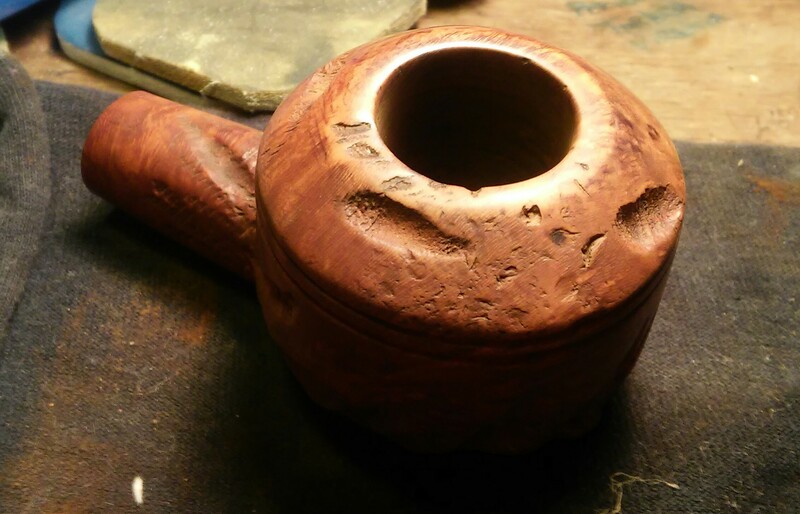 With no luck, I instead filled in the indentations with thick superglue and briar dust. I sanded the area with micro mesh until the repair was even. 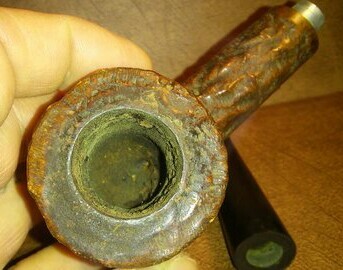 The mortis and draft were heavily caked with tars and old tobacco it would need to be cleared before going any further. I un-rolled cotton balls and twisted them together to form a long swab. Using the swab I turned it tightly into the mortise and then filled the chamber with a little EverClear and waited for the alcohol to be absorbed. 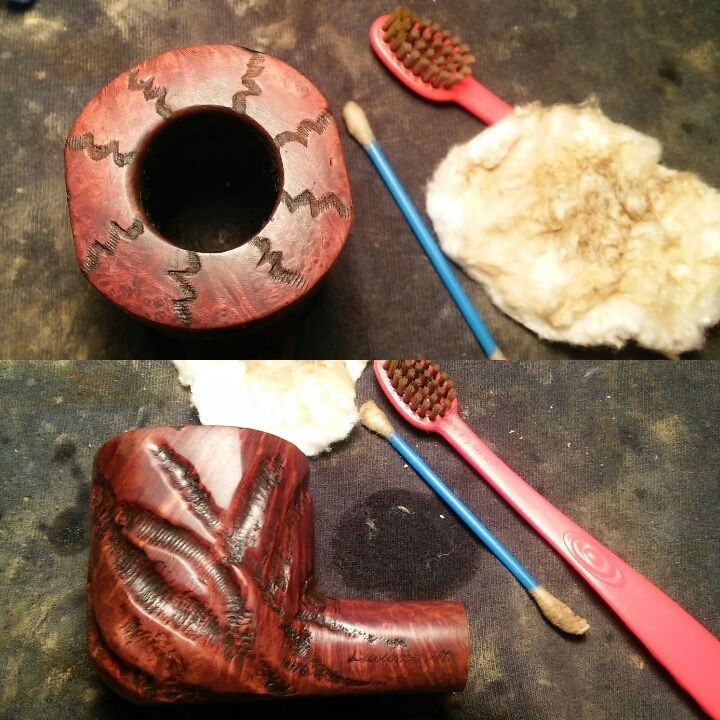 Letting it soak for a bit, I removed the swab and cleaned the mortise / draft with stiff pipe cleaners and shank brush until the draft was clear. With the draft cleared it could now receive a retort . 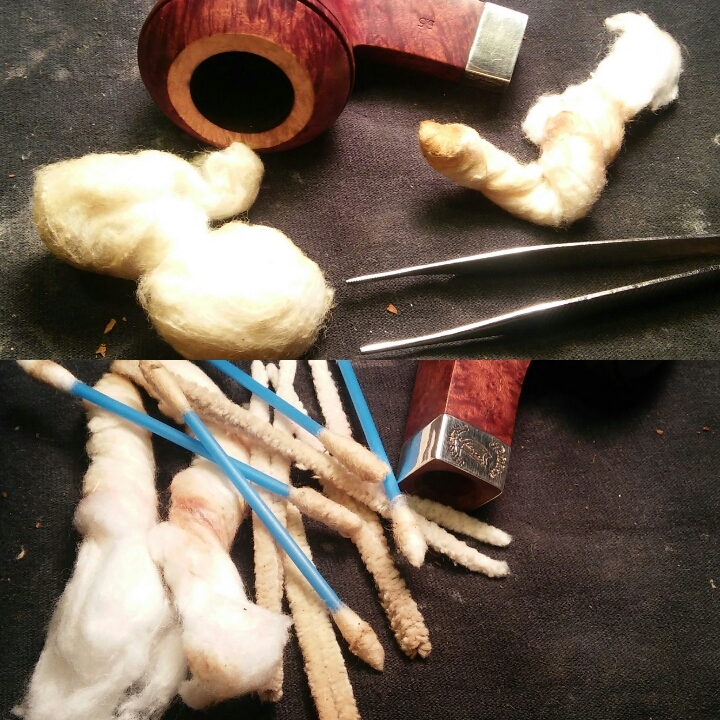 I cleaned the internals one last time after the retort with Q-tips, cotton swabs and stiff / soft pipe cleaners. 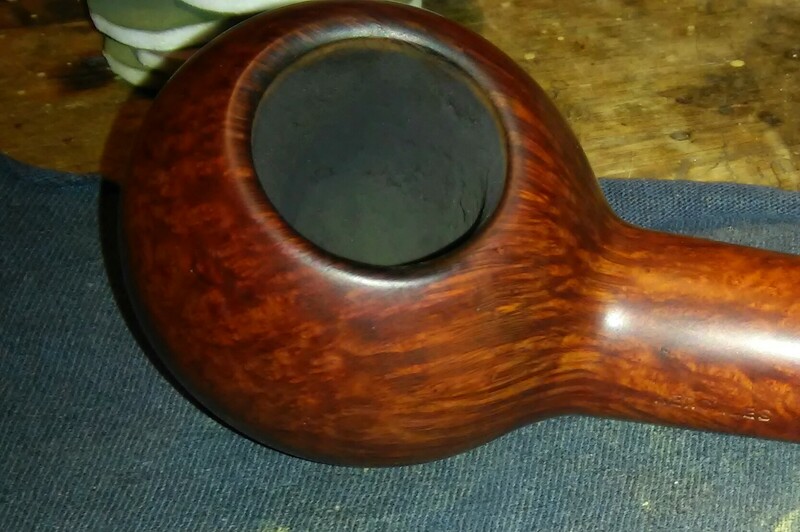 With the bowl ready for a buff I moved to the stem, starting with non-bleach Soft Scrub . 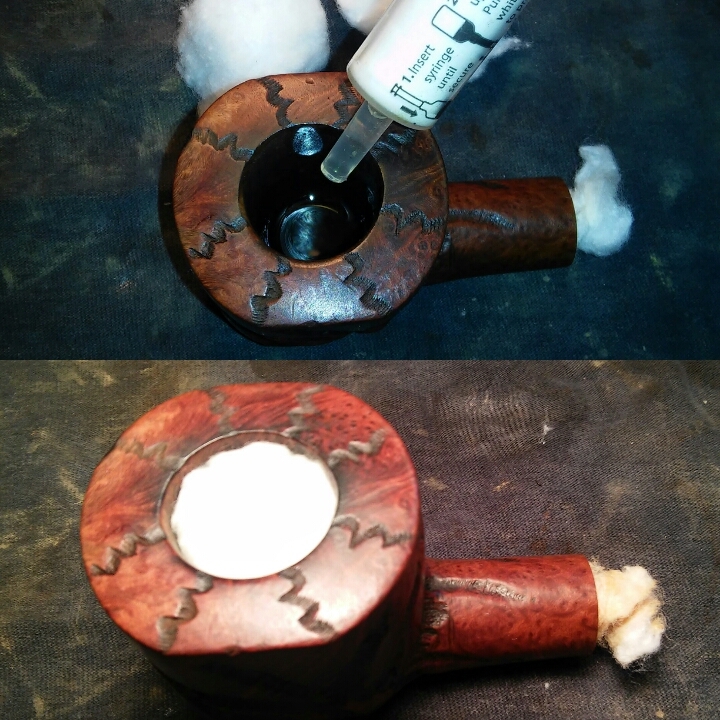 I scrubbed the stem vigorously with cotton balls and a rag until the oxidation was removed. 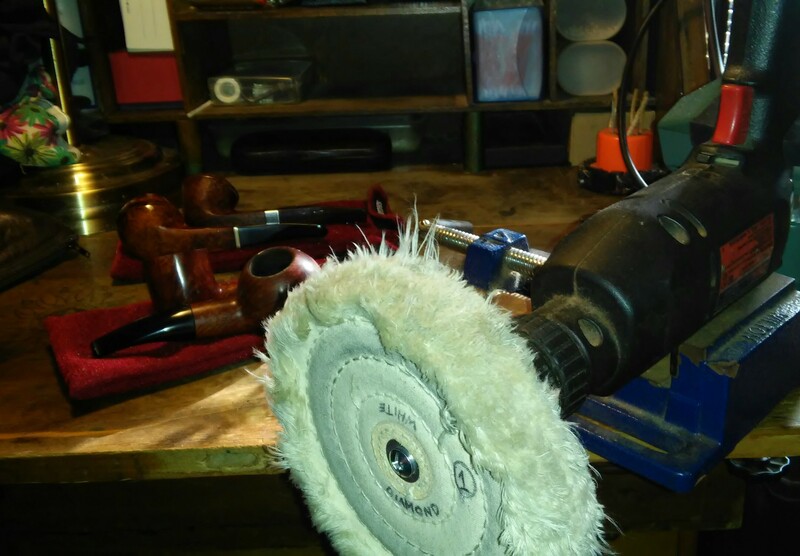 I tapped off the shank so I wouldn’t disturb the finnish with my sanding . 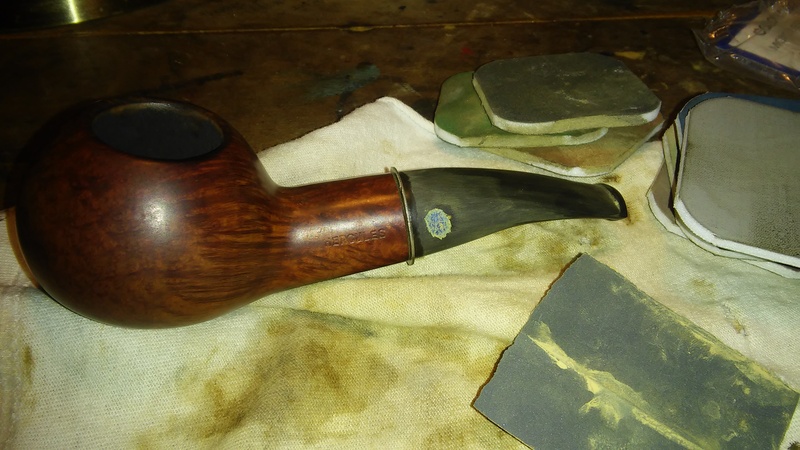 Starting with a 400 grit wet sand, I sanded the bit/ lip area to remove some of the tooth impressions and to rough up the surface so the CA glue repair would have a good hold . 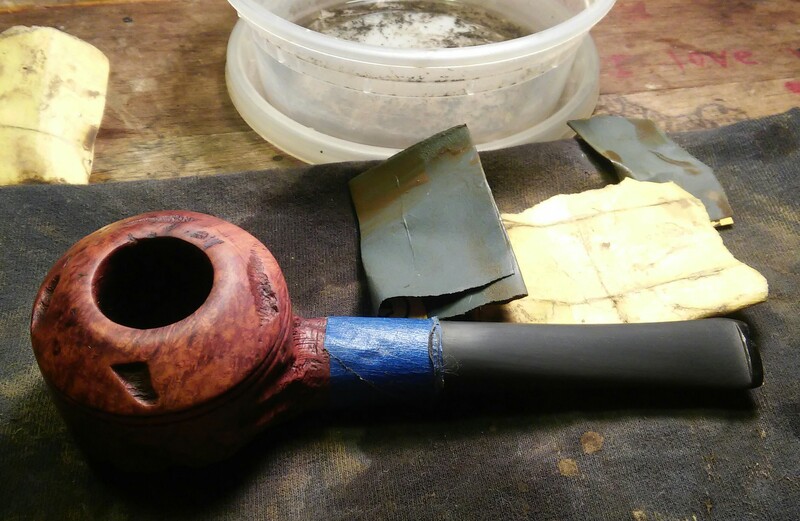 I then wet sanded the entire stem with 1000 grit paper and then wiped down the stem with alcohol . I would repair the worn button first by first tapping off the area of the repair. I mixed thick black CA glue and activated charcoal powder into a paste and applied it to the button spreading it evenly across the surface. 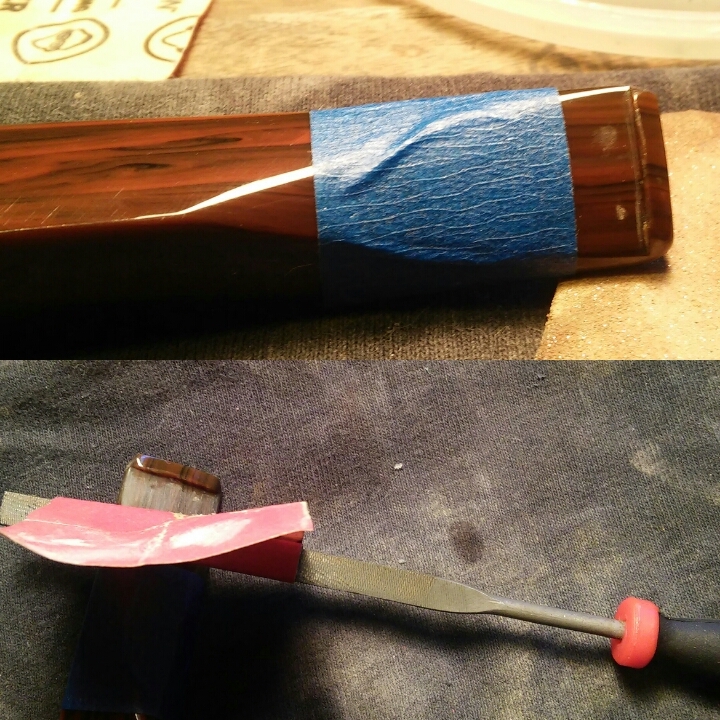 I let it setup for a few minutes, then I removed the painters tape and sprayed the repair with accelerator. I now filled in one stubborn impression on the bit with the paste and sprayed it with accelerator . I left it overnight to cure. 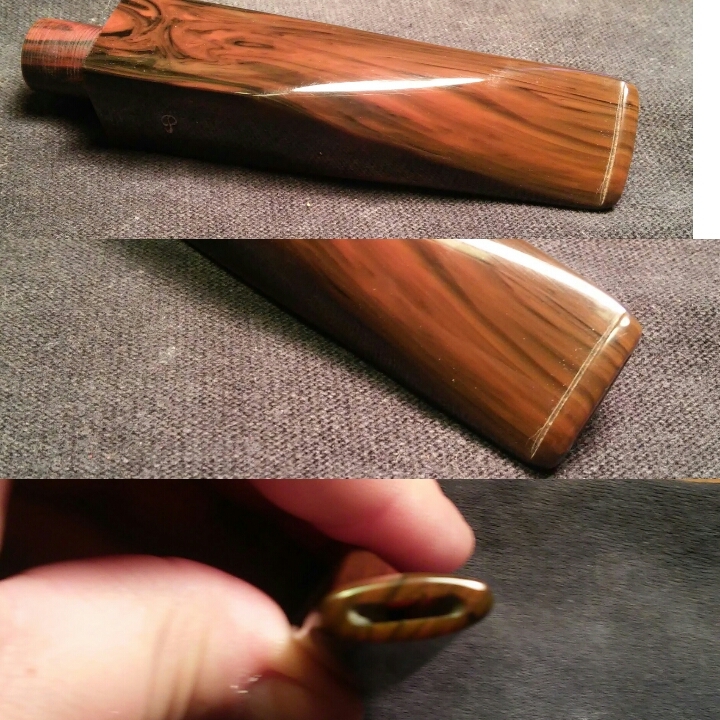 The following day after curing overnight I began forming the new button, using needle files and 400 grit sandpaper. I tapped off the bottom side of my needle file so I could get the file flush against the new button. 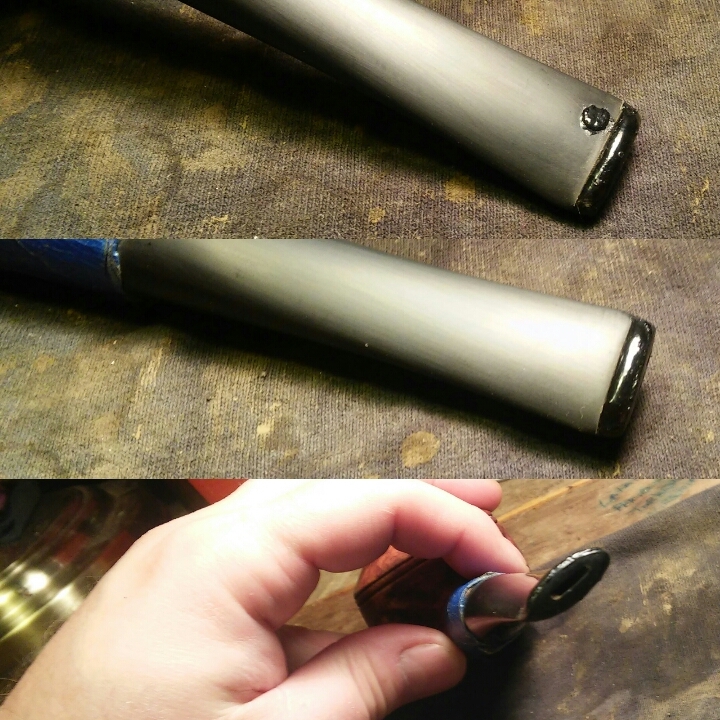 I then sanded the stem with 1000 grit sandpaper to remove the file marks. I worked though the various micro mesh pads. 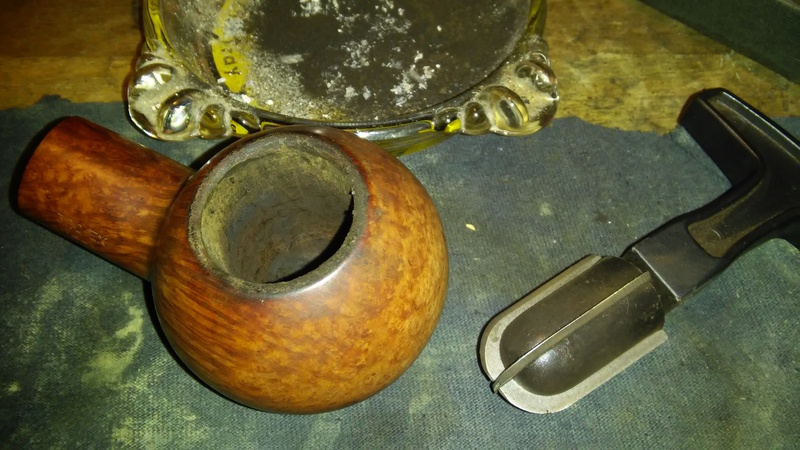 Next I gave the bowl a quick sand with worn micro mesh to bring out the final shine. I applied a little Howard’s butcher block conditioner with a rag working it into the nooks and crannies and letting it soak for a few minutes, removing the excess with a clean rag. Final buff with white diamond, carnauba and a micro fiber hand buffing. 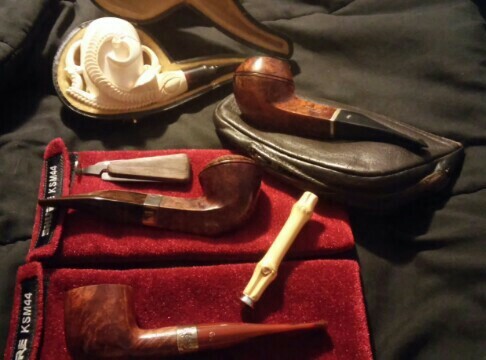 The pipes my wife picked up with the exception of the Savinelli, were in great shape. 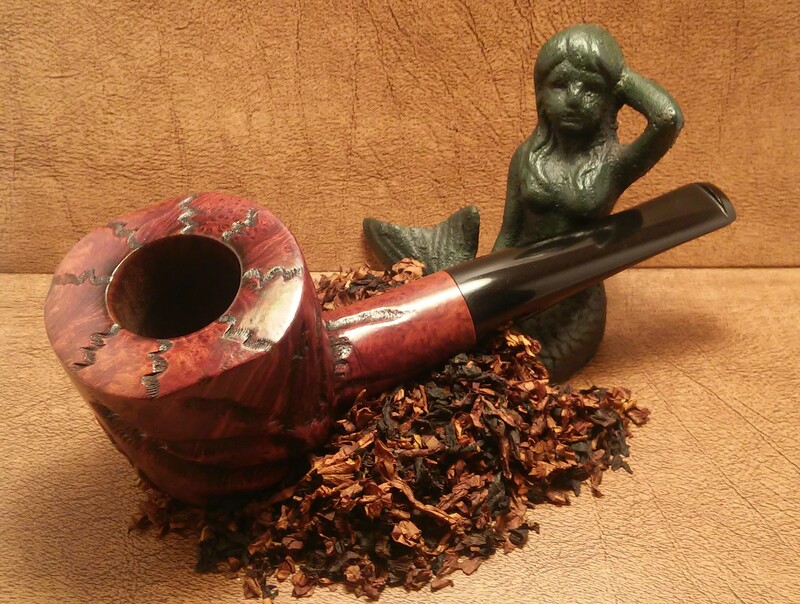 The Peterson’s- two were lightly smoked and one un-smoked. The Harp B.5 is the next to my desktop. From what I could find via web/collector sites I believe this Pete is from 2007. ( please correct me if this info is wrong) With the addition of three more Peterson’s it has brought my collection to seven. 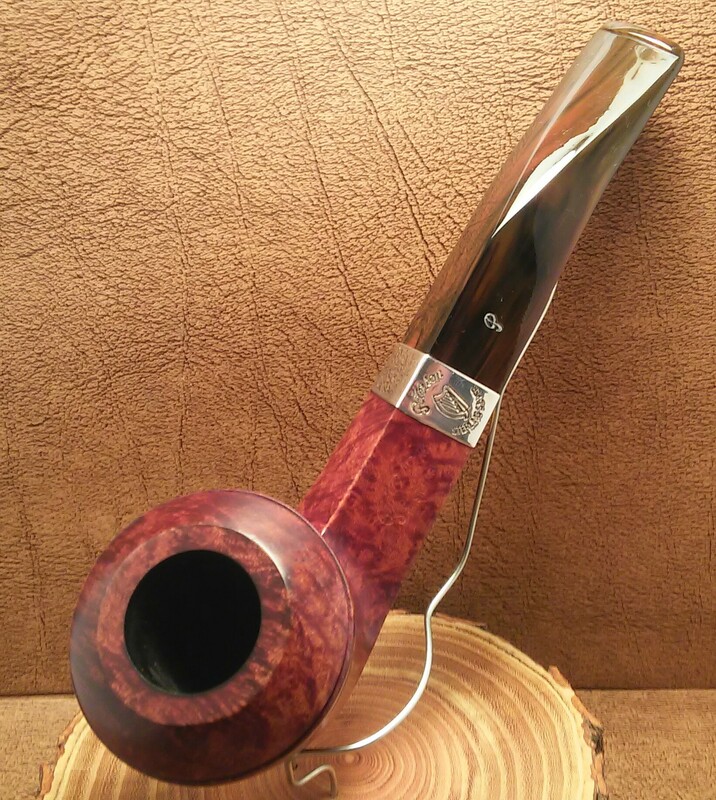 The B.5 is one of many I’ve had my eye on, the smooth bulldog shape and fishtail stem made this comfortable not only in hand but also clenched in jaw. 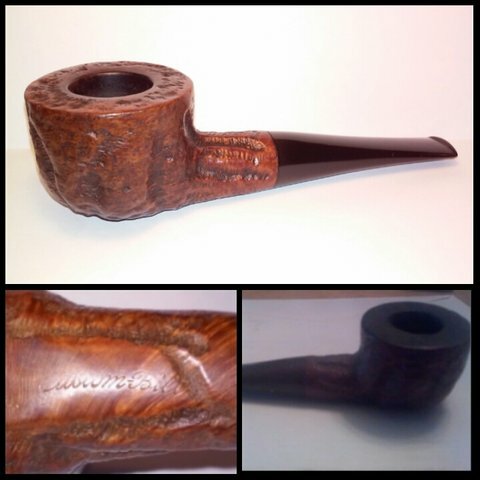 Lightly smoked and in decent condition just a few problem areas. 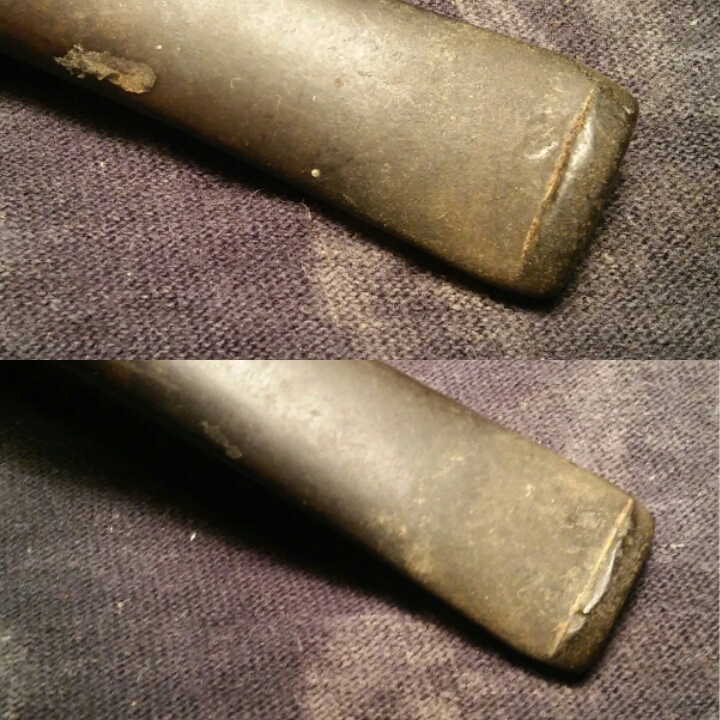 A couple of tooth impressions, a scratch on the bowl and a burn on the rim that was deeper then first thought. 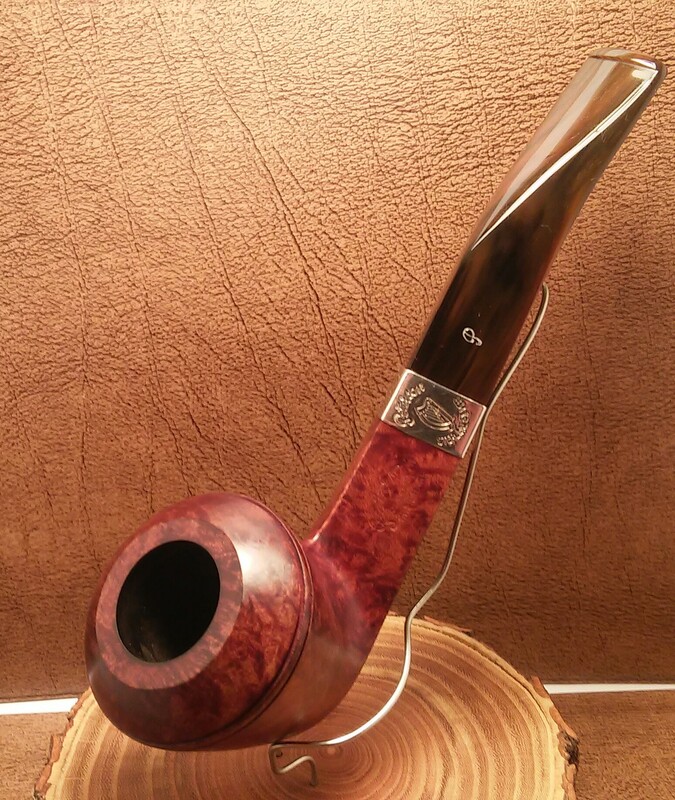 When I first received the pipe the silver band was tarnished, this was my wife’s department. She used her silver jewelry cleaning trick, cigarette ash, a little saliva and rubbed in with a fingertip, then wiping with a damp rag. 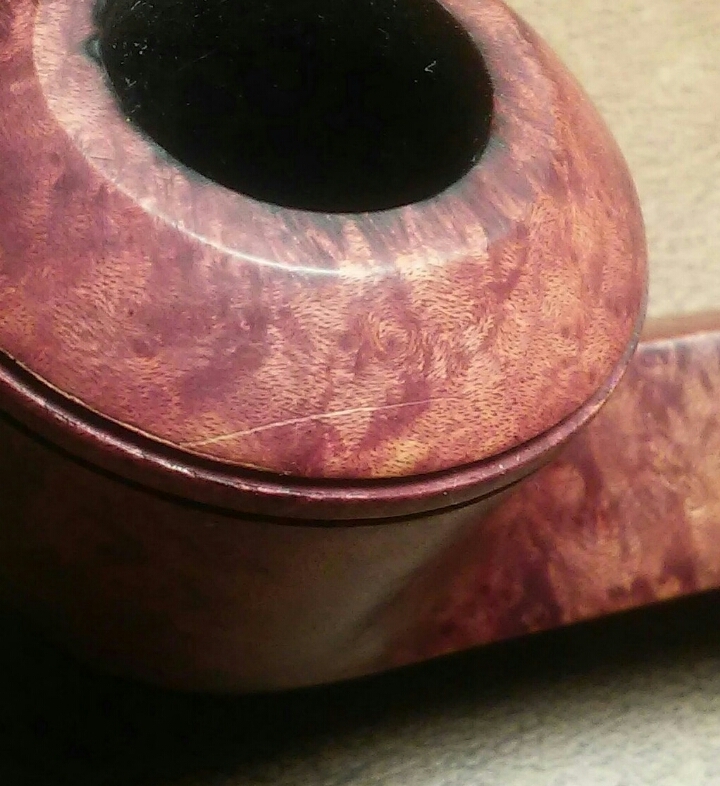 For a newer and lightly smoked pipe I was surprised to see the bowls finnish was very worn in certain areas. 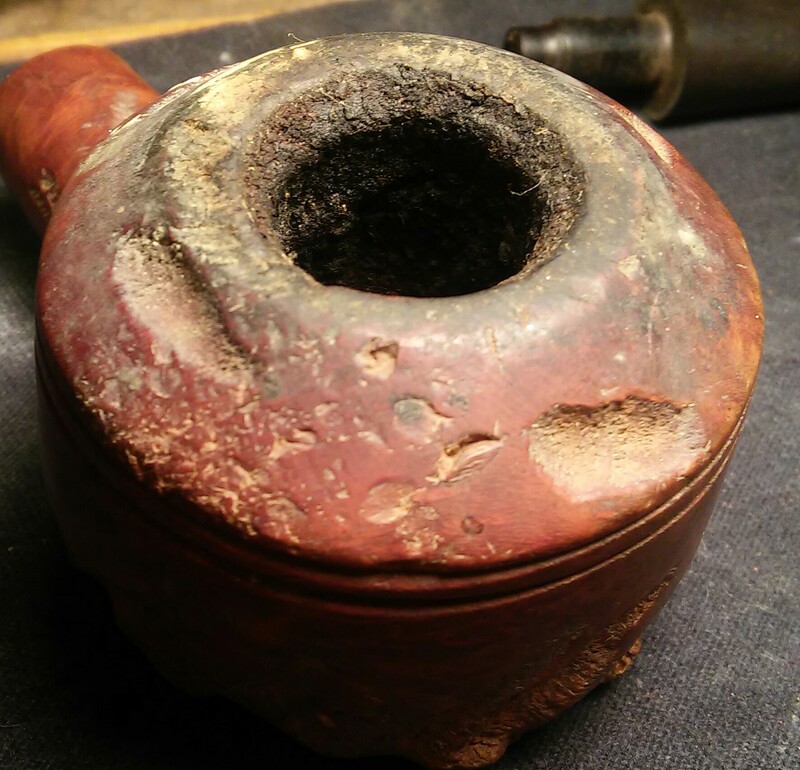 With some pipes in the past the worn finnish was a result of a hot bowl from rapid puffing, it would have to be re-stained. 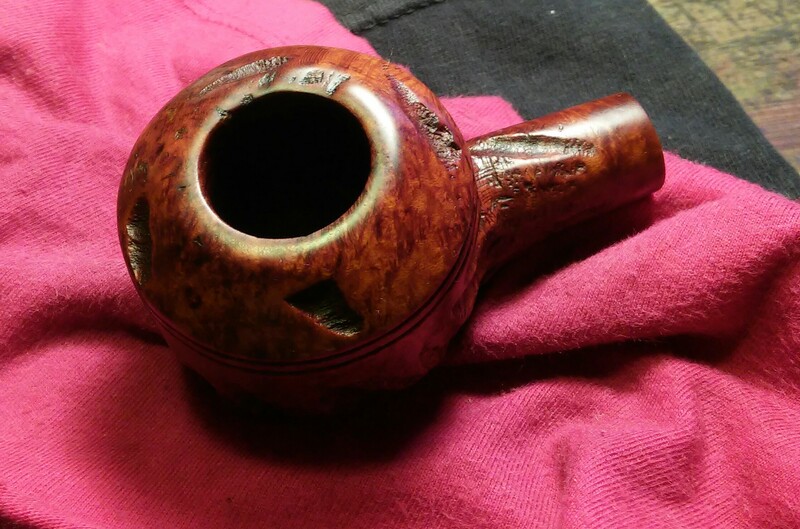 I started with Murphy’s oil soap and moved on to acetone to remove the rest of the finnish. I was happy to see I had not uncovered any filler. The burn on the rim seemed it was just surface deep and could be easily removed with little work but it had gone deeper then I originally thought. 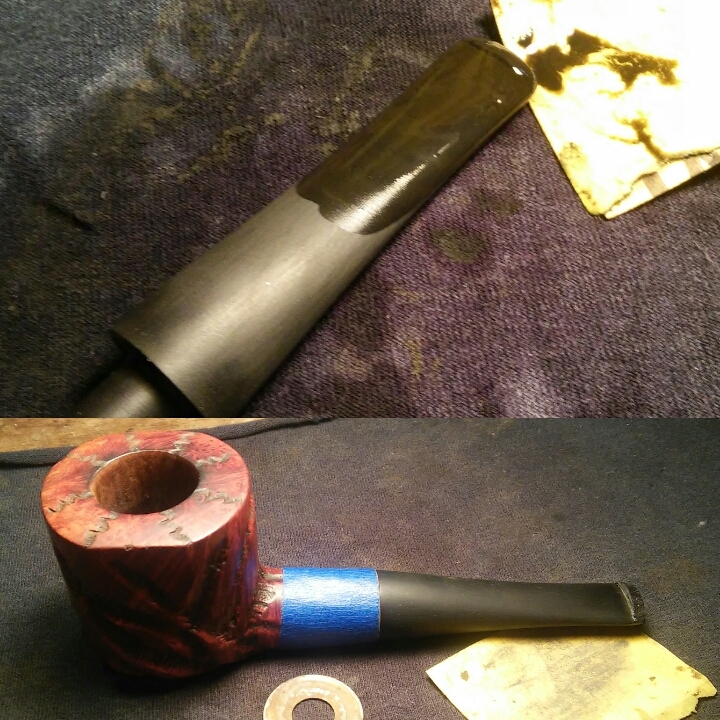 I taped 1000 grit sandpaper paper to my desktop and began slowly taking layers off until the burn was almost gone, I didn’t want to remove too much and change the shape of the pipe. What remained of the burn hopefully would blend with the new stain. The scratch at the top of the bowl luckily did not affect the bulldog ring around the bowl. I started with a heated butter knife and a damp rag to steam some of the indentation that came along with the scratch. After the steam had raised some of the indentation I used worn micro mesh pads to remove the rest of the scratch. 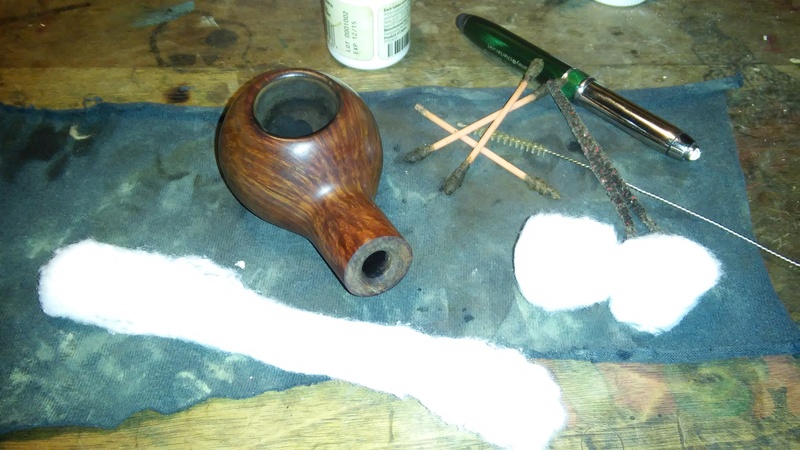 With the bowl set aside I began work on the stem first by cleaning the internals with EverClear, shank brush and pipe cleaners and worked until the pipe cleaners came as they went in. 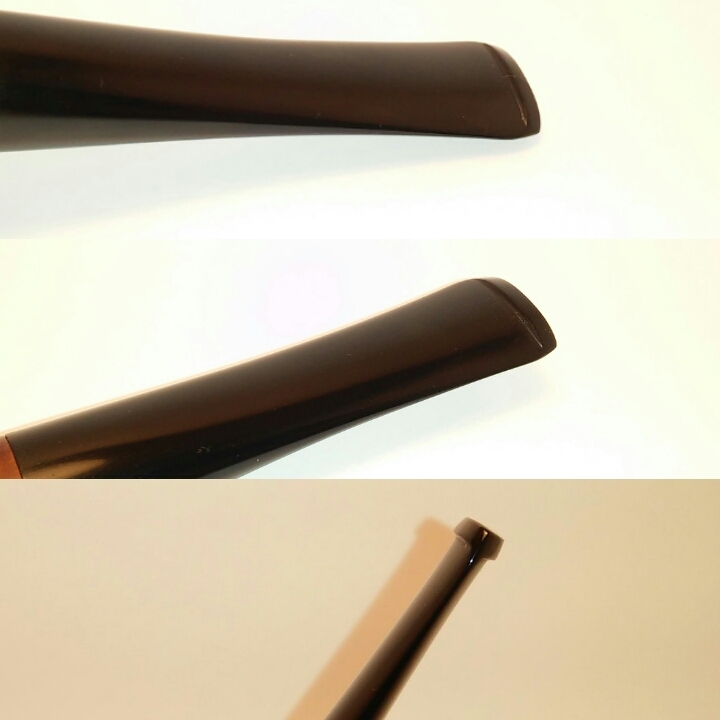 Then the externals I worked carefully around the P on the stem so it would not accidentally be removed by the alcohol. I started with the button, sanding the area with a 1500 micro mesh pad and then wiping down with EverClear. 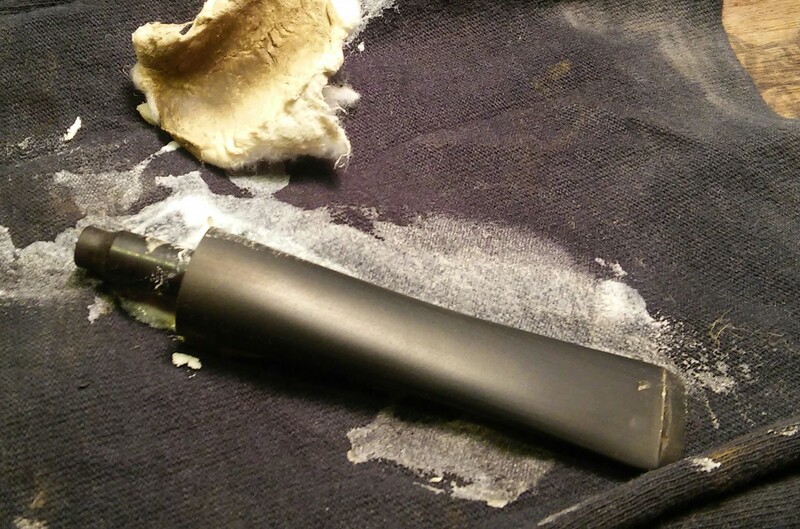 I mixed a paste of CA glue and activated charcoal powder to apply to the worn button. 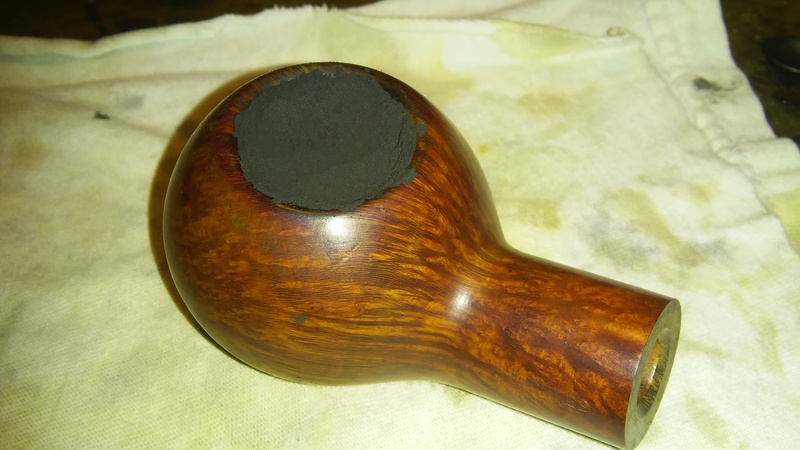 I used less activated charcoal powder then normally because of the cumberland stem, I didn’t want one big dark spot. 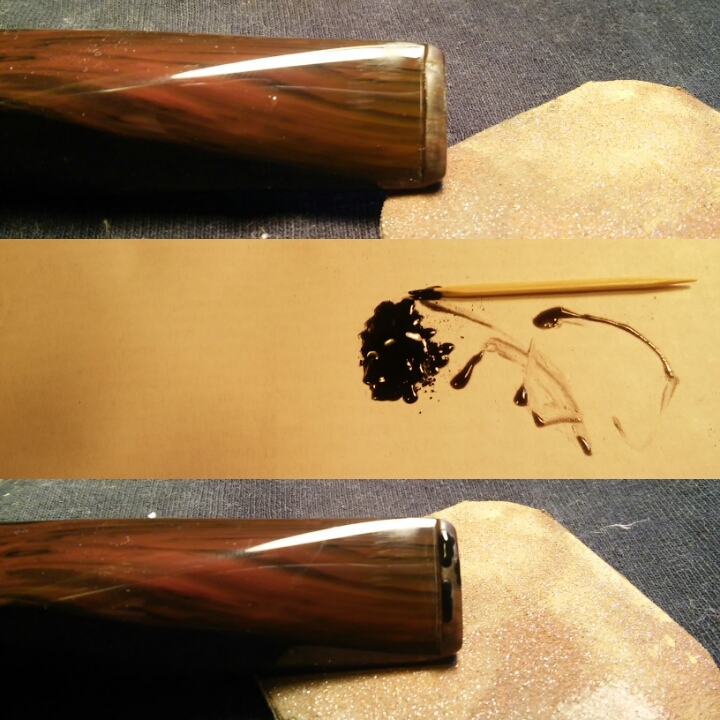 I applied little dots of the paste with a toothpick and then sprayed it with accelerator and left it to dry. 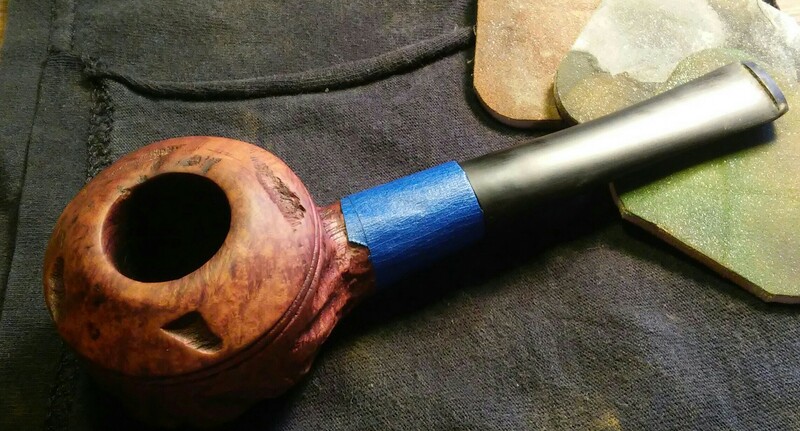 I tapped off the stem with painters tape so my work on the bit/lip area would remain in one spot, the rest of the stem was in good condition there was no need to make more work for myself. 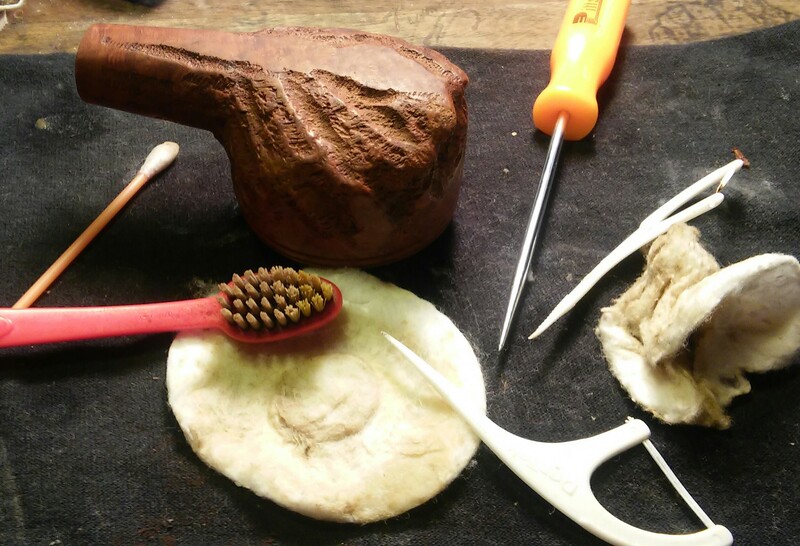 I wrapped 400 grit paper around a flat needle file and wet sanded the area of the impressions. 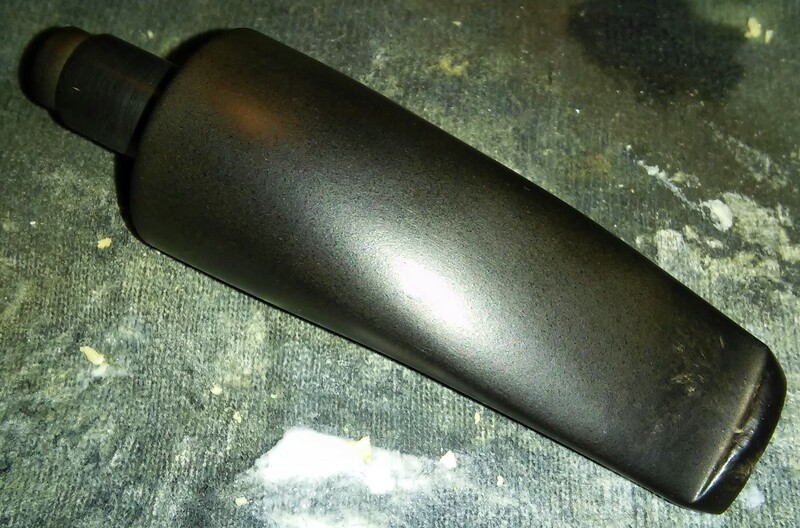 After the 400 grit wet sand there was still one stubborn impression present, I filled the impression with a dot of the paste and sprayed it with accelerator. I then moved to the various mico mesh pads to smooth over the stem and button. It wasn’t perfect but better then before. 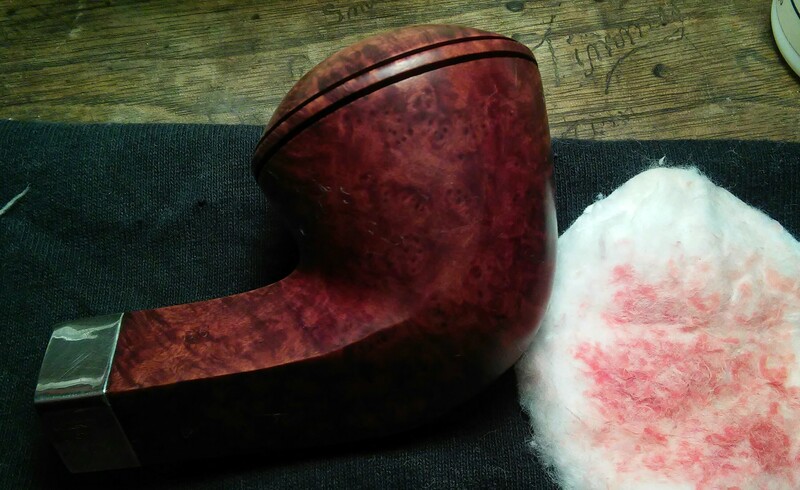 This stem was a little more difficult, as I began removing the tooth impressions I uncovered bubbles within the stem that would also have to be filled. 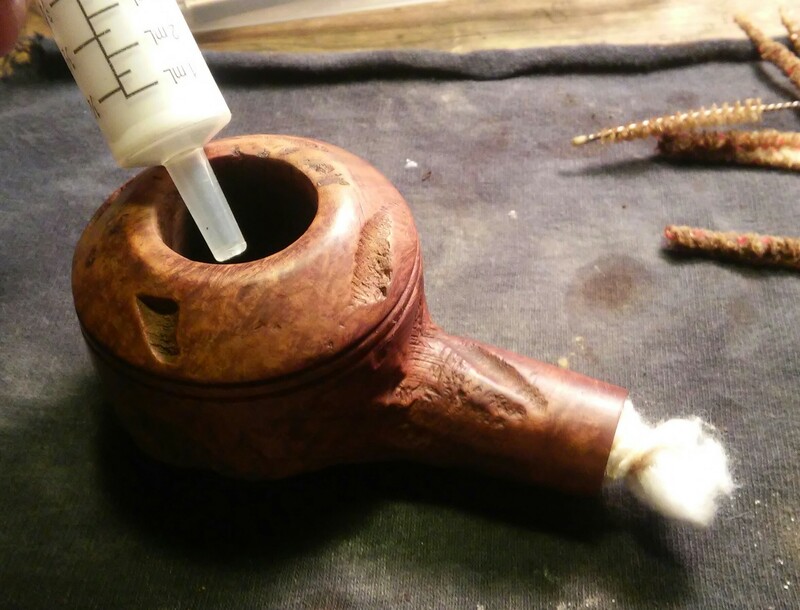 After sitting for a few hours I removed the cotton balls/swab and proceeded to clean the internals with EverClear, Q-tips, swabs and pipe cleaners until the pipe cleaners came out as they went in. 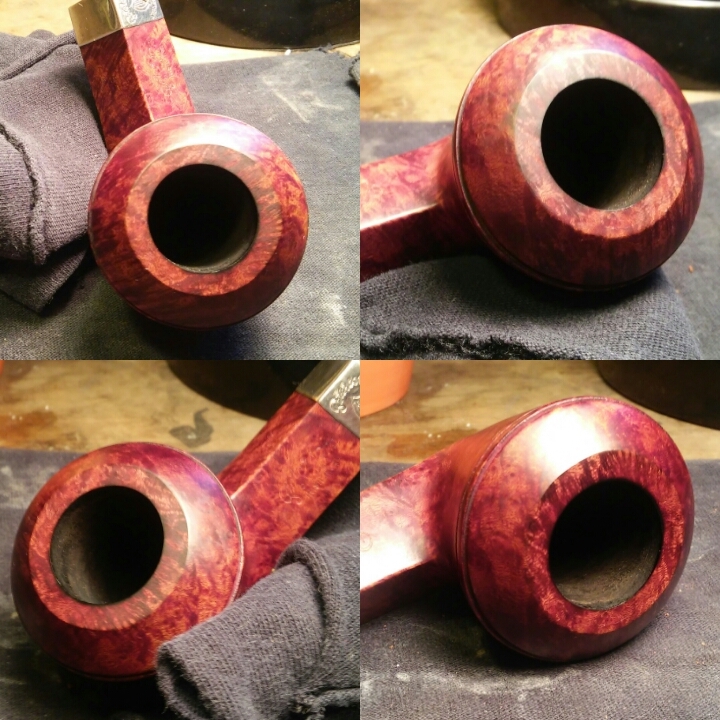 While working on the pipe over a two day period I realized I was quite happy with the way the pipe had colored from handling it, I decided to try and match the rim to the bowl coloring. 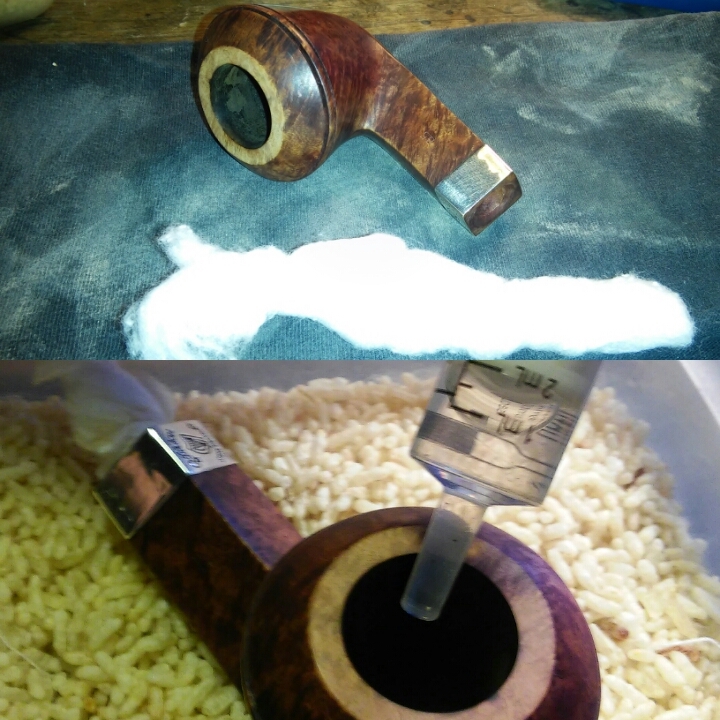 There was still light stain left on the pipe after the acetone wipe down, the acetone seemed to remove a reddish top coat leaving the darker walnut finnish underneath. 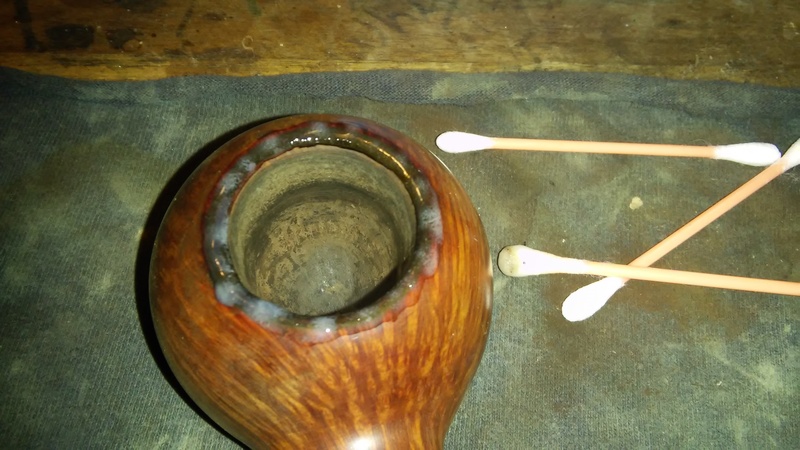 I used touch up stain markers to match the rim to the bowl, I applied several coats and hit it with a Bic lighter to set the stain, wiping away the excess with an alcohol dampened rag until I had a close match. Buffing with white diamond, carnauba and a micro fiber hand buffing . 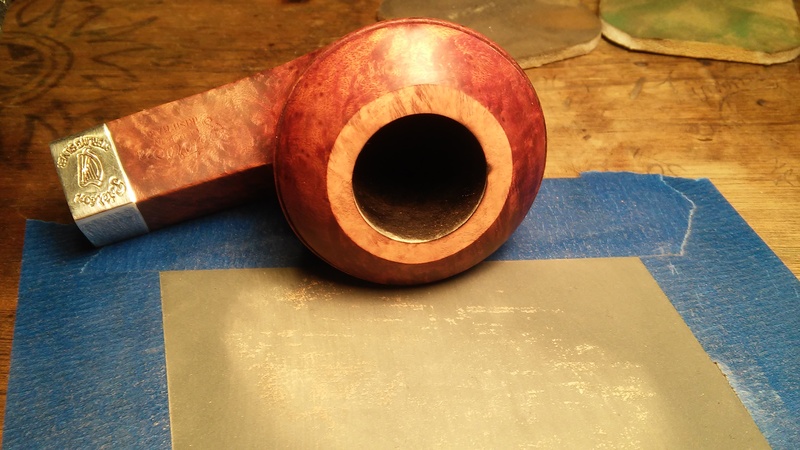 I’m starting to realize the photos of my process on many of the pipes I’ve redone in the past are lost. 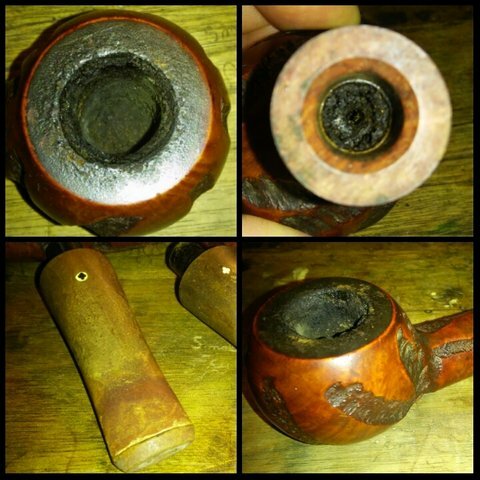 Luckily I have before and after photos, please bare with me as new pipes are redone I will add more detailed photos of my process. I decided to put together a compilation of some of my favorites. 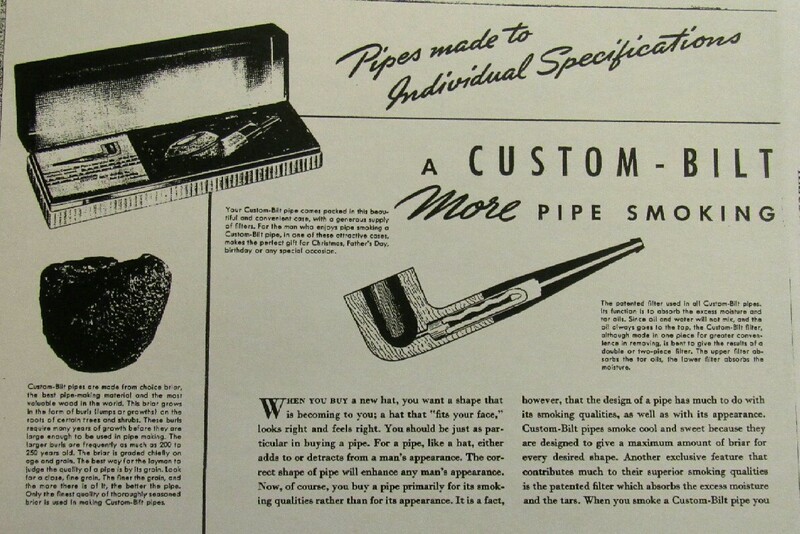 Custom-bilt pipes there will be quite a few of these. I’m a collector and I haven’t seen an end in sight. Each one has it’s own personality “As Individual As A Thumbprint“ stands true. The few below were redone in the past year. My process has remained the same for that time, I followed the same process as in my previous posts. 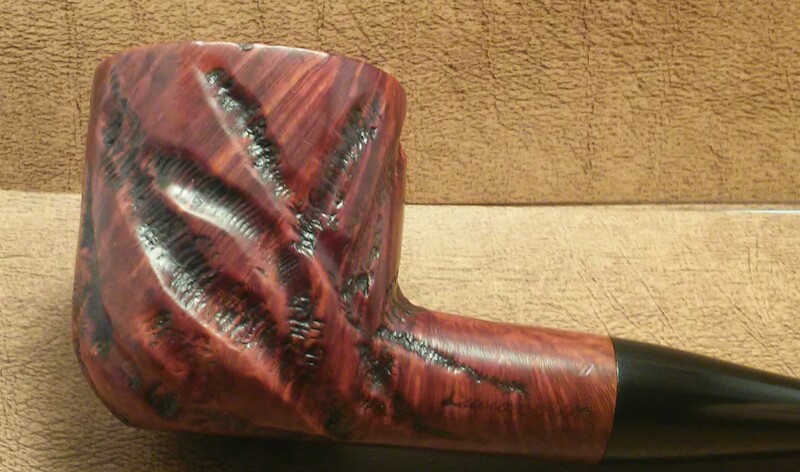 Images & information courtesy of Bill Ungers As Individual As A Thumbprint-The Custombilt Pipe Story. 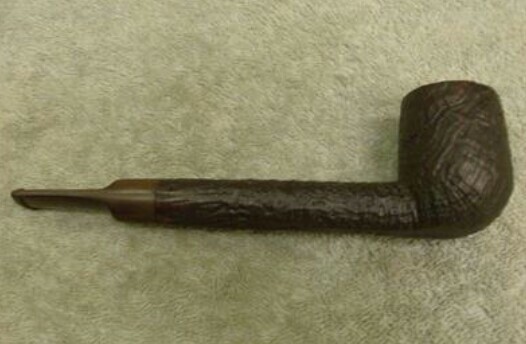 First up a Custom-Bilt patiented filter system billiard from what I’ve read it was made between 1935 to around 1941. 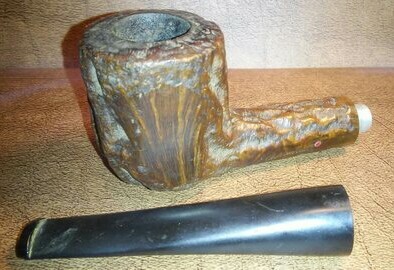 A very large, long and partically rusticated pipe .I have to two in my collection one redone and one in the to do box. 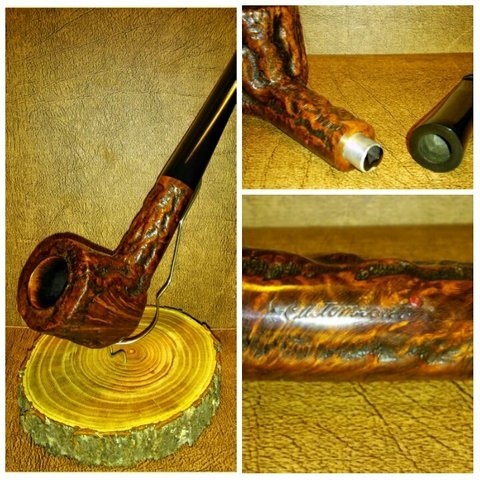 Next up another Custom-Bilt filtered pipe. 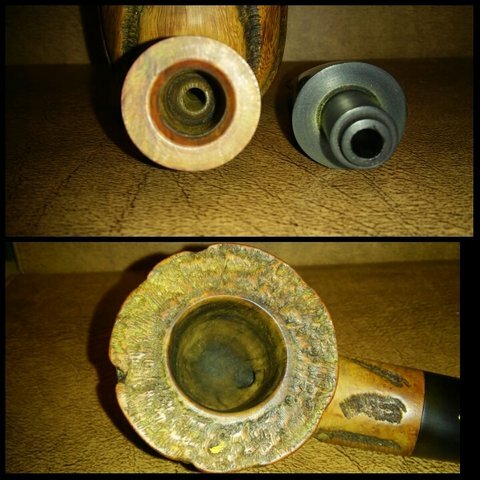 In my first post I went through my process of cleaning a similar pipe that also had it’s rubber filter insert. I could not find an exact year or much else on these. Between 1941-1946 ? Something had nested in the stem, luckily it had moved out prior to my receiving it. One of the smallest bilts I own. The first Custom-Bilt I purchased around three years ago. 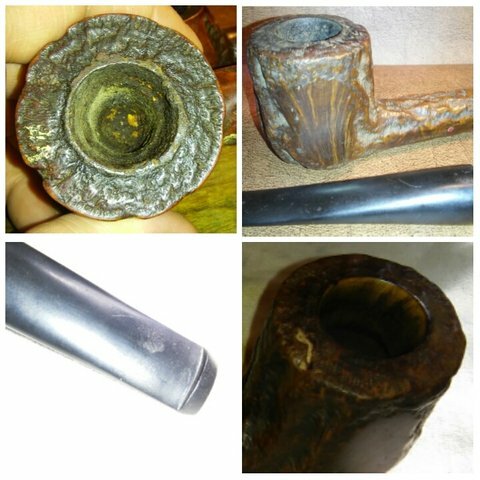 The bottom right photo was from the auction. Still one of my favorites. 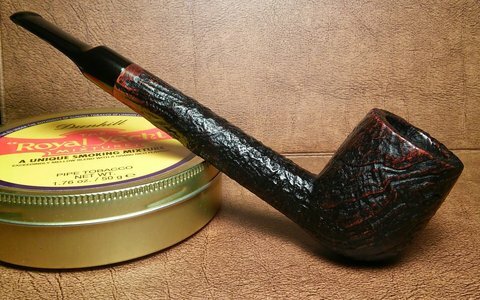 Typically I go after older Custom-Bilt pipes but there was something different about this one. 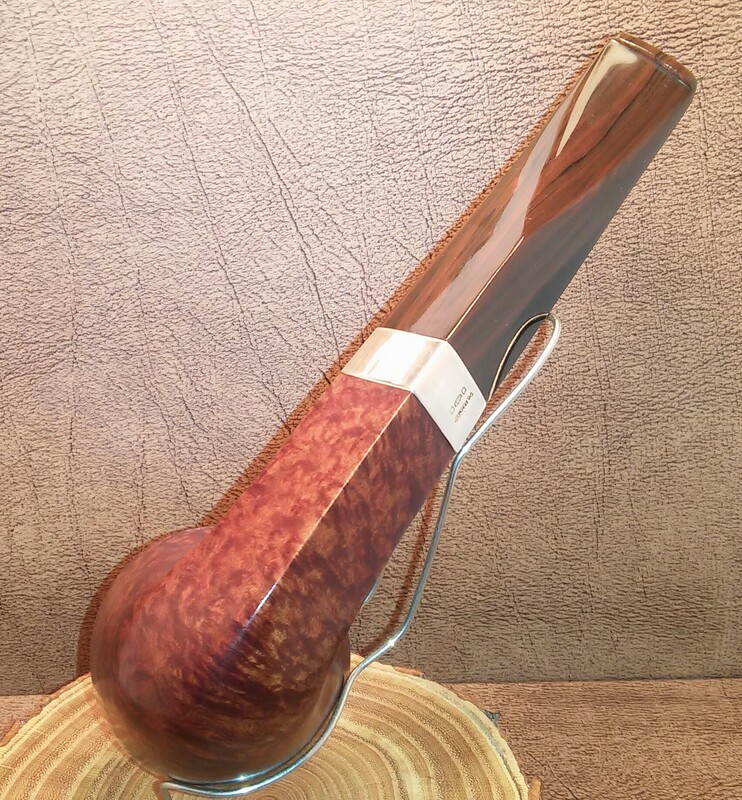 The Canadian shape and shell finish was eye catching . 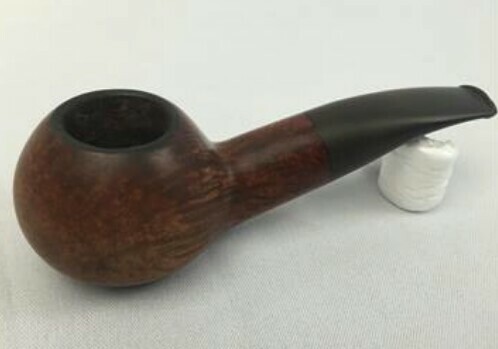 It’s my one and only Canadian style pipe. The ad above I believe is from the late 40’s early 50’s from what I could find I think this is where my pair falls. 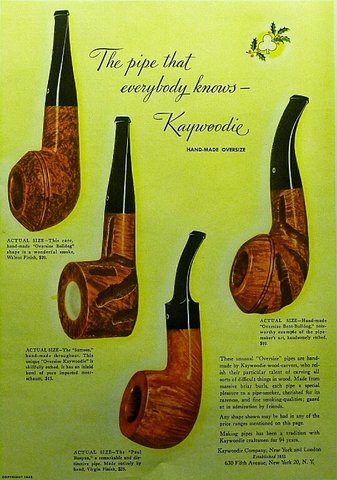 Some of my first estates were Kaywoodies. Living in New York most of my life I loved reading of there history and the successful building of a brand everyone knows. The only thing I couldn’t get past was how small there pipes were. 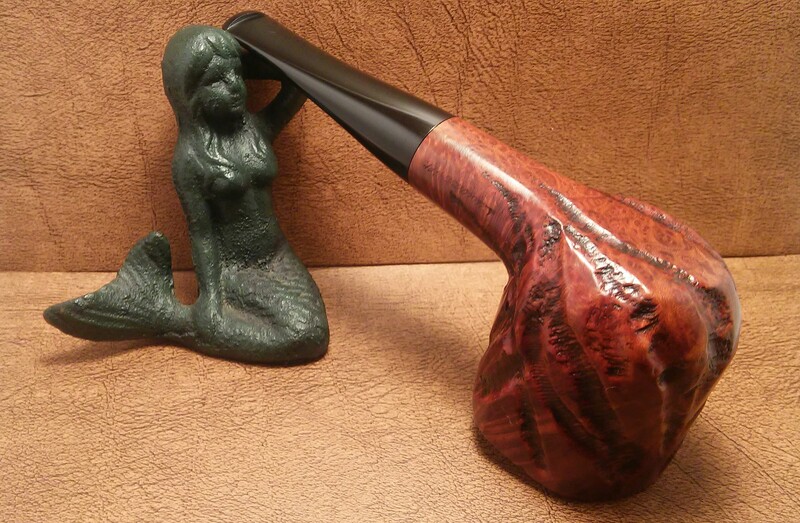 I have a few in my collection from the 30’s and 40’s that make my wife laugh when I smoke them. 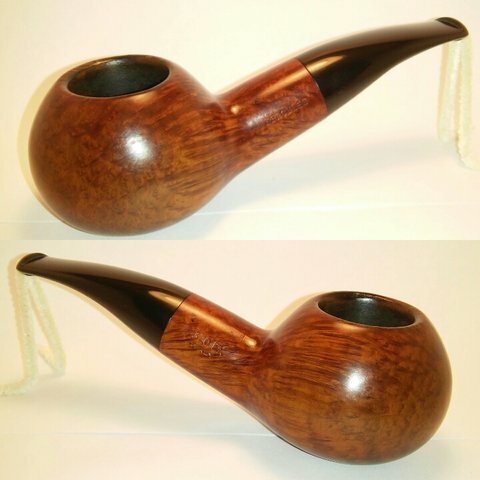 I’m a pretty hefty guy so in turn I would need to find a hefty Kaywoodie. 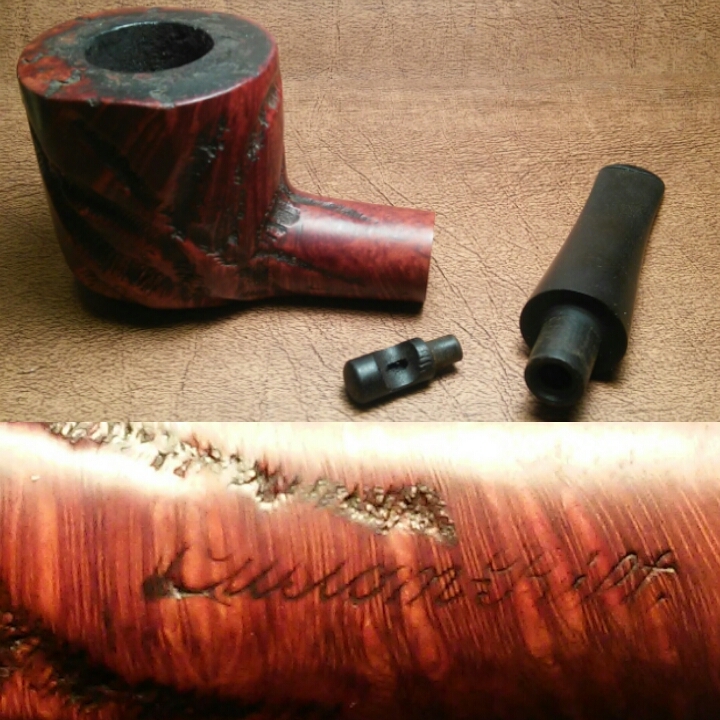 Six months ago I found my chance with the Kaywoodie Handmade Oversized line. 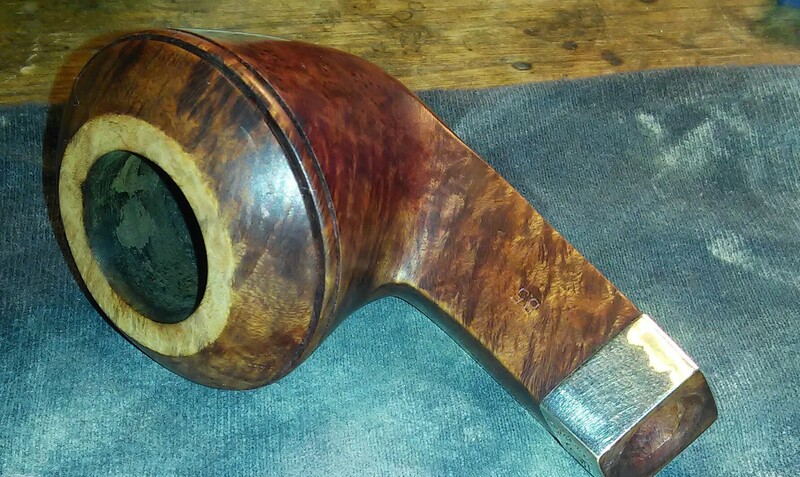 They are big and beautiful pieces of Briar reminiscent of my first love Custom-bilt. 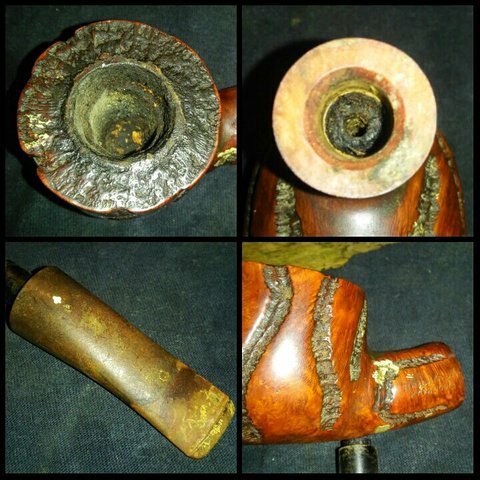 I originally posted this refurb on Pipes Magazine with the help of forum members I was able to put these beauties back in service. 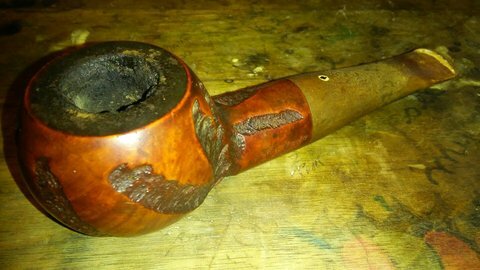 The first well loved pipe. 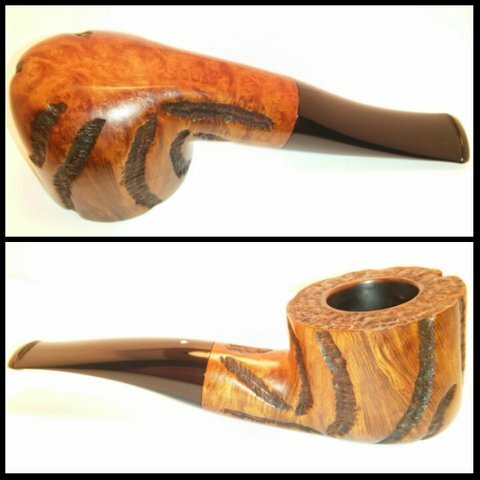 And the second equally loved pipe. 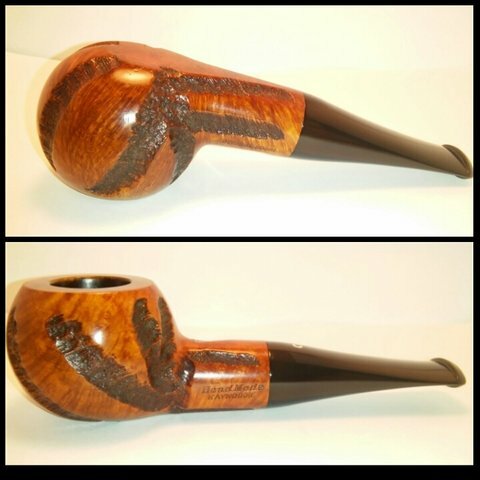 The second pipe I could not find a profile shot, I also did not take pictures of my process but I remember it like it was yesterday .Each one was well used and apparently never cleaned. 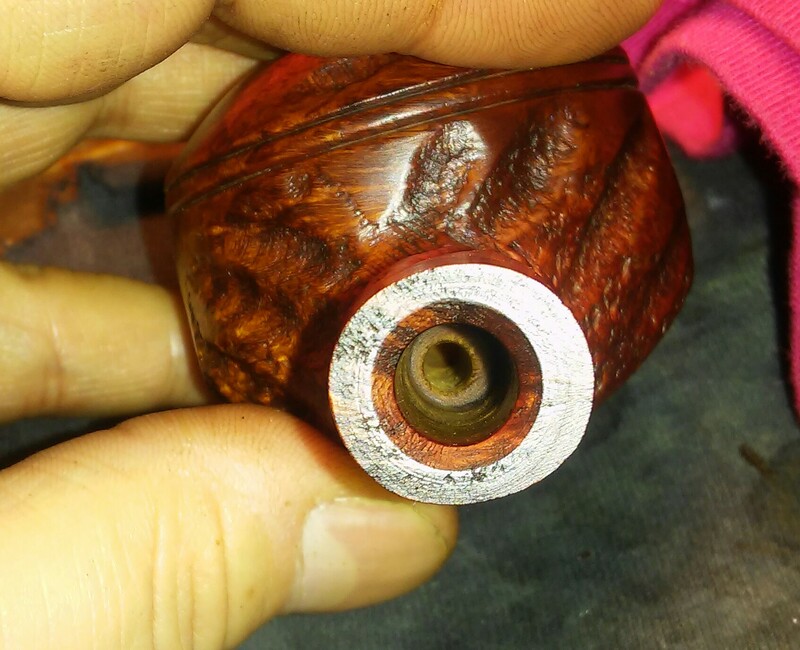 I started by removing the cake with my Castleford reamer starting with smallest and ending with the largest, keeping it centered at all times. Then sanding the chamber with 400 grit sandpaper, in this case the previous owner’s lack of cleaning actually preserved the chamber it looked almost new after removing the cake. 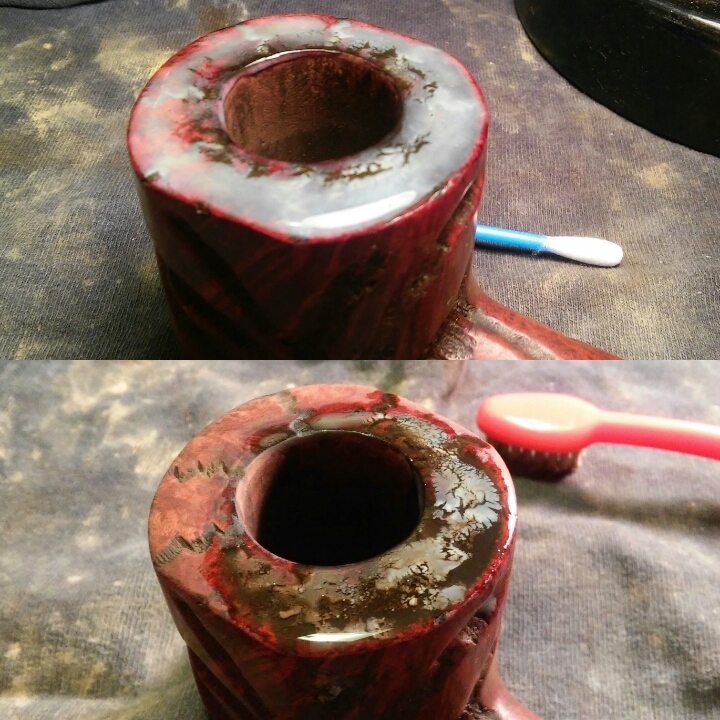 The rim was heavily caked I applied a very generous amount of Method wood for good polish with Q-tips and worked it in with a children’s toothbrush I would have to repeat this multiple times before the tars were completely removed. 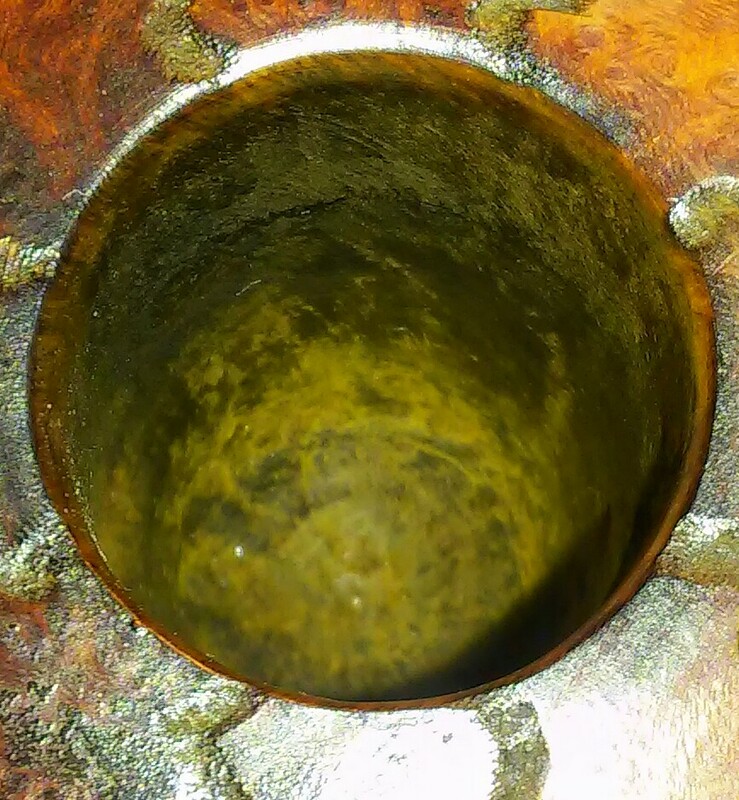 There was also white paint imbedded in the deep grooves of one of the pipes. I used the polish on these areas as well applying it to the paint and leaving it to soften it up. 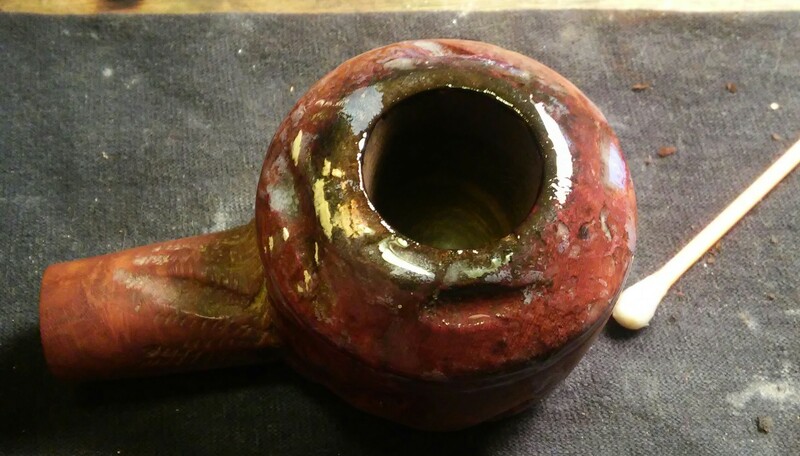 After it softened I was able to remove the paint with a toothbrush and dental pick. I also cleaned the exterior with the polish at this time. 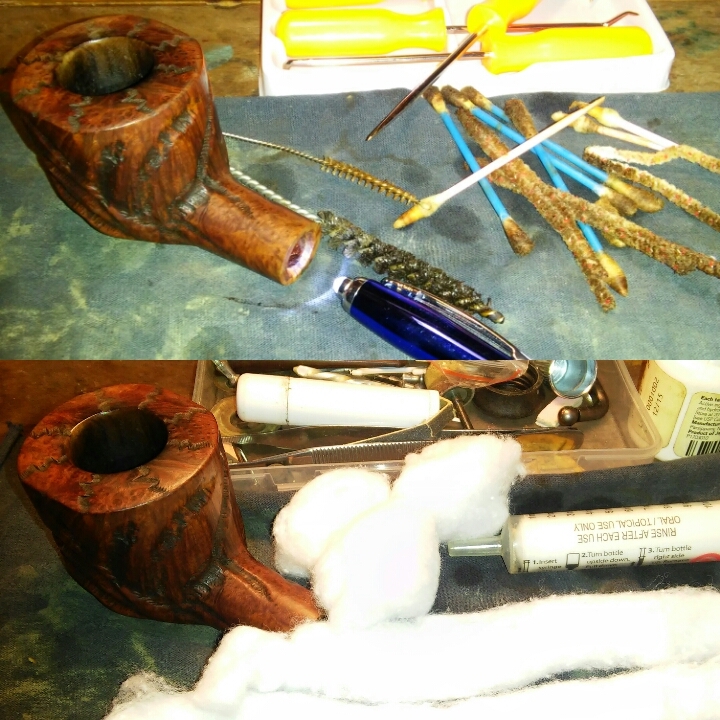 I cleaned the internals with EverClear,shank brush, Q-tips and stiff bristle pipe cleaners ending with unrolled twisted cotton balls in the mortise. 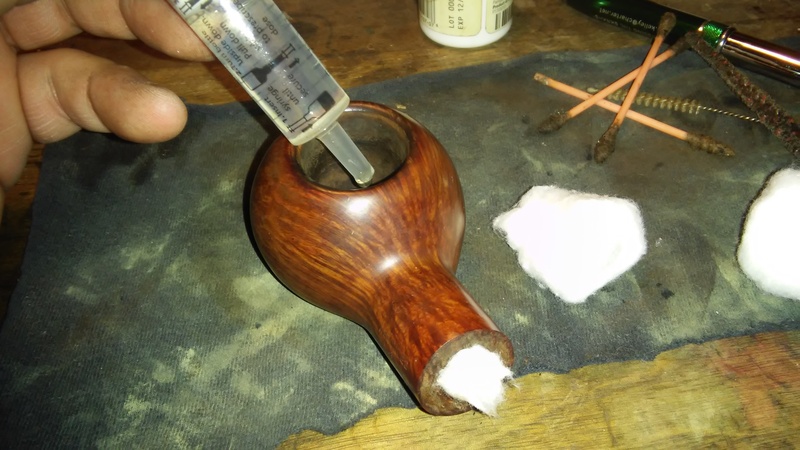 I added a little EverClear to the chamber to be absorbed by the cotton,once absorb I filled the chamber with three cotton balls, EverClear and left it to soak. This is where things got interesting. 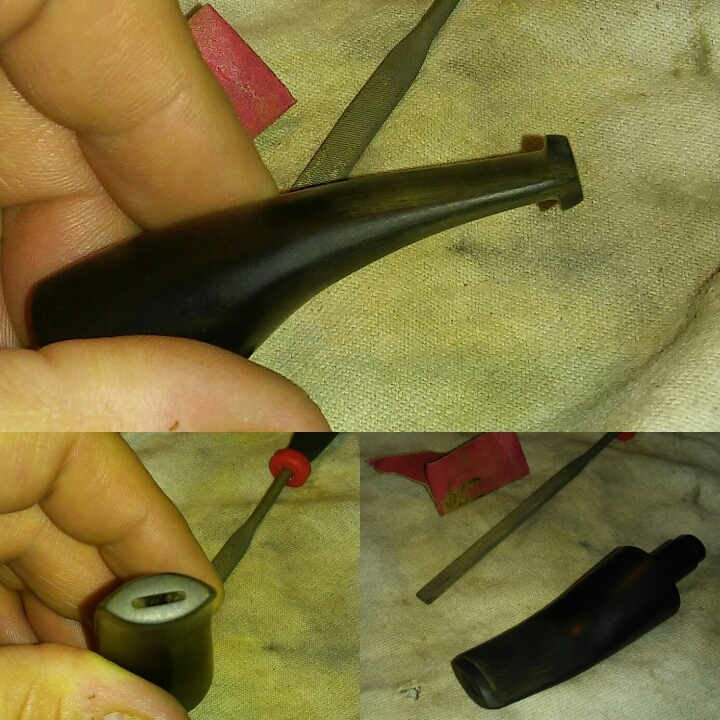 With the bowl set aside I began work on the stems, cleaning the internals/ externals with EverClear this is when the smell hit me. It was like nothing I had smelled before or since and my wife was not pleased (my work area is in our bedroom). This was my wife’s answer to the problem. You gotta love her. 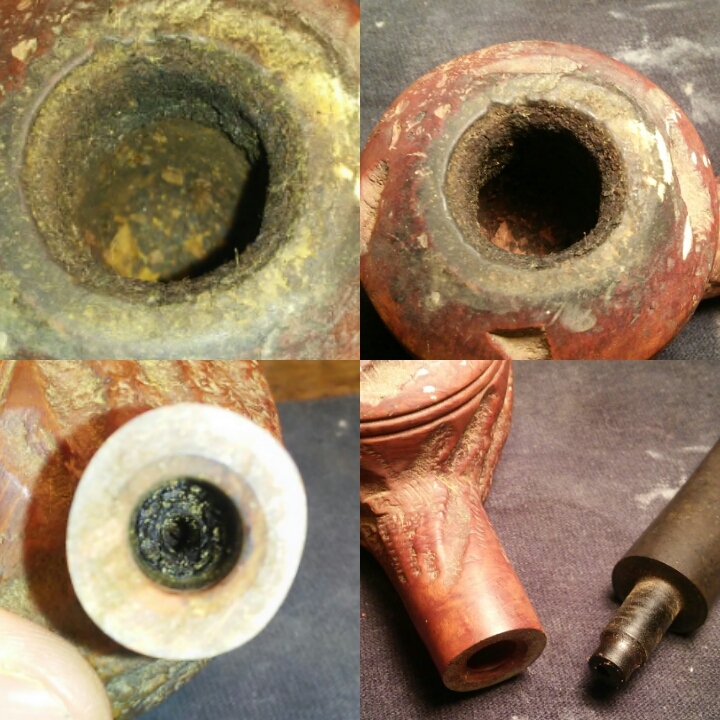 I turned to Pipes Magazine forum members for help they said it was sulfur I was smelling a handful of suggestions were posted oxyclean, Soft Scrub, vinegar & baking soda, soaking in alcohol, multiple retorts and replacement, tried them all to no avail and replacement in my mind was not an option. 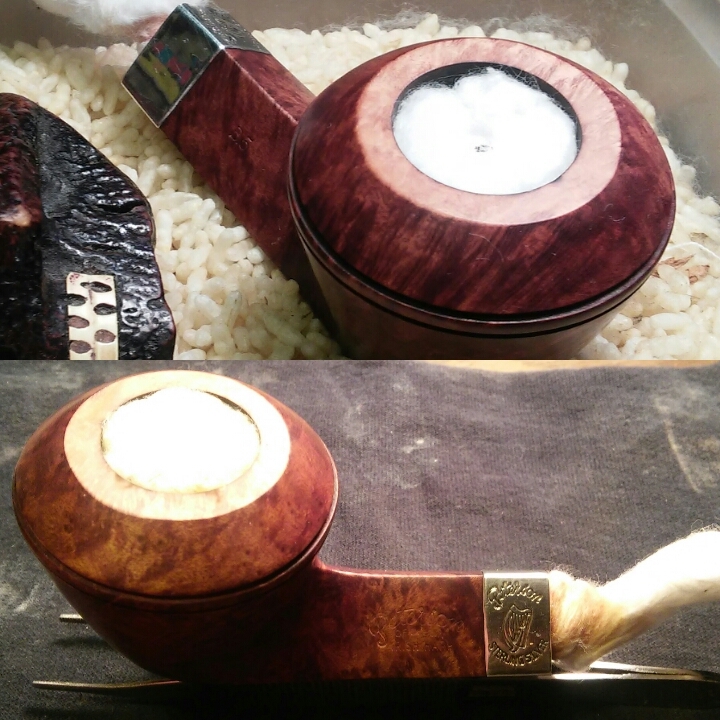 I decided while my wife was at work I would continue cleaning the stems scrubbing first with Soft Scrub removing the oxidation and then wet sanding with 1000,1500,2000 and 2400. At this time two forum members suggested a soak in bleach I was apprehensive at first as I have never used bleach before but they assured me no damage would be done. 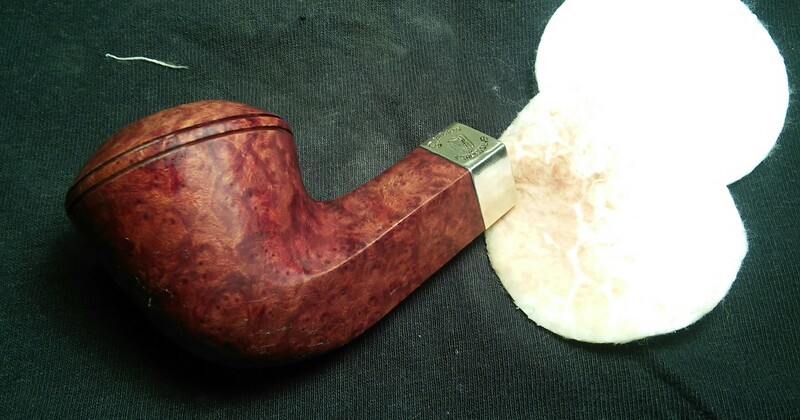 So with a little Vaseline over the logo just in case I processed to soak the stems in a 4 to 1 mix of bleach and water, at first I thought it did the trick but the scent would re-emerge as soon as I began sanding. 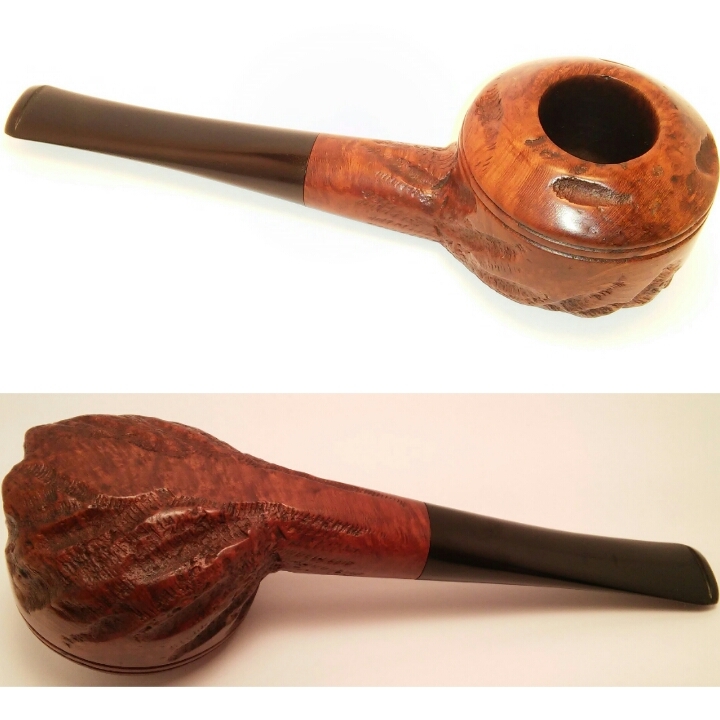 After numerous intervals of soaking and sanding over a three day period the smell finally began to dissipate and now that a few months have passed the scent is completely gone. 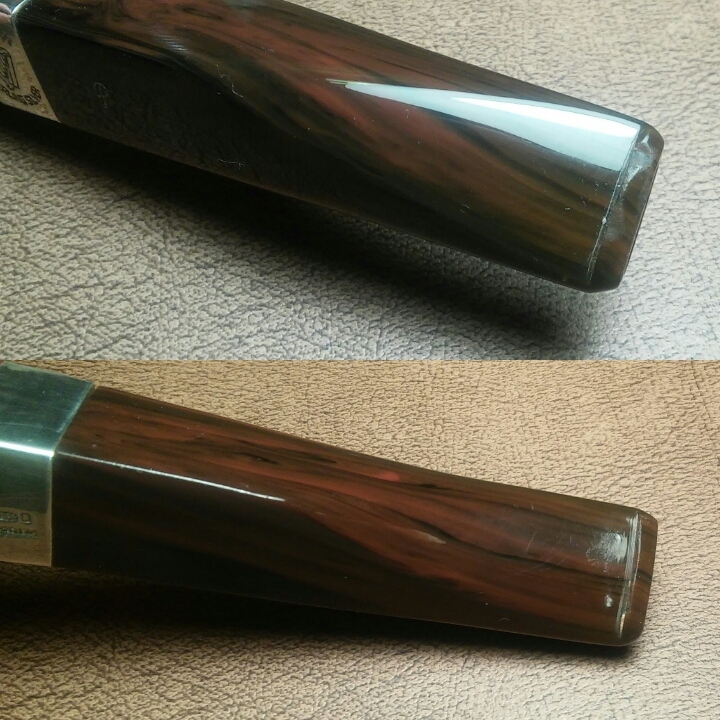 I was able to save the original finish and would not have to re-stain. 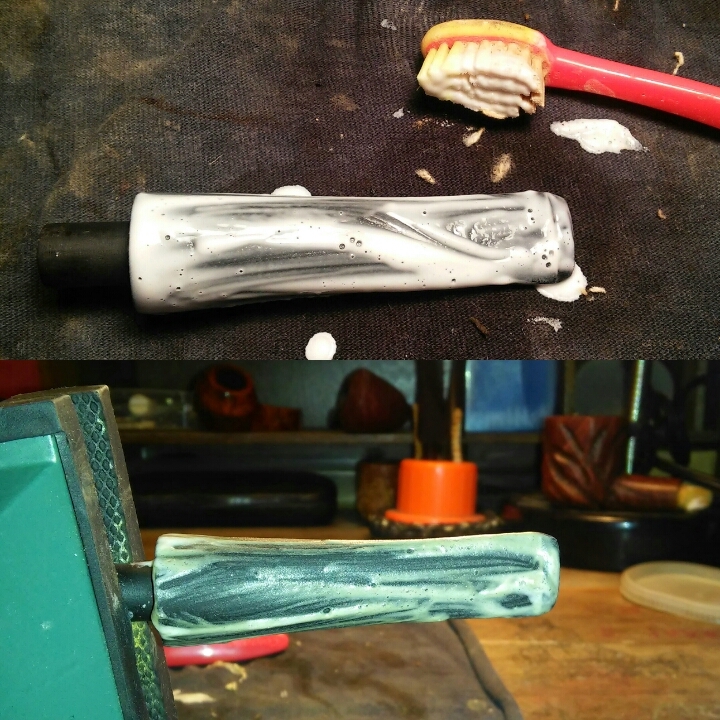 I figured they closely resembled my CustomBilts so I applied a little Howard’s butcher block conditioner and set them aside for a few minutes to soak it up and then hand buffing off the excess. They were now ready for the buffer. About a month ago my wife surprised me with a haul of five that I could have never pulled off. She is an incredible woman and apparently has a better eye then myself. This was the worst of the lot. 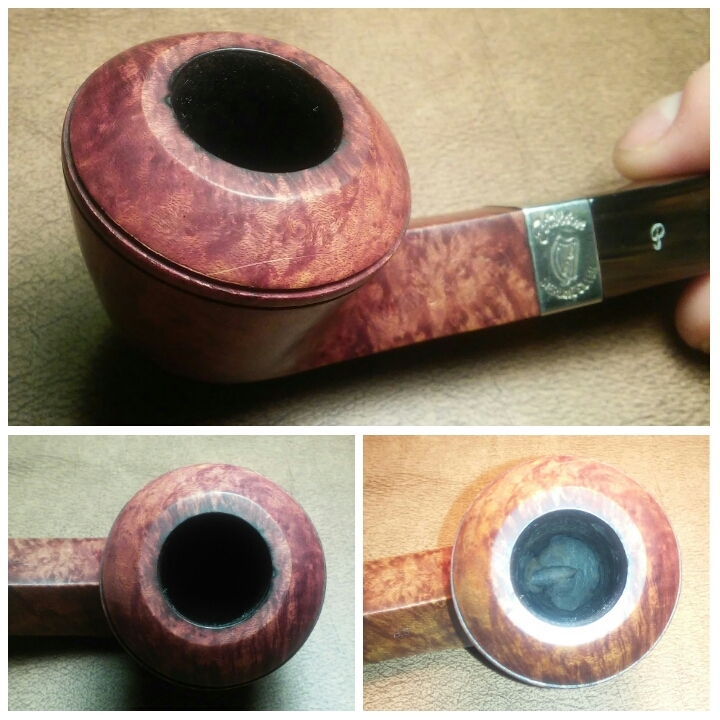 The pipe upon receiving, a Savinelli Hercules 320 EX. She was big and beautiful. 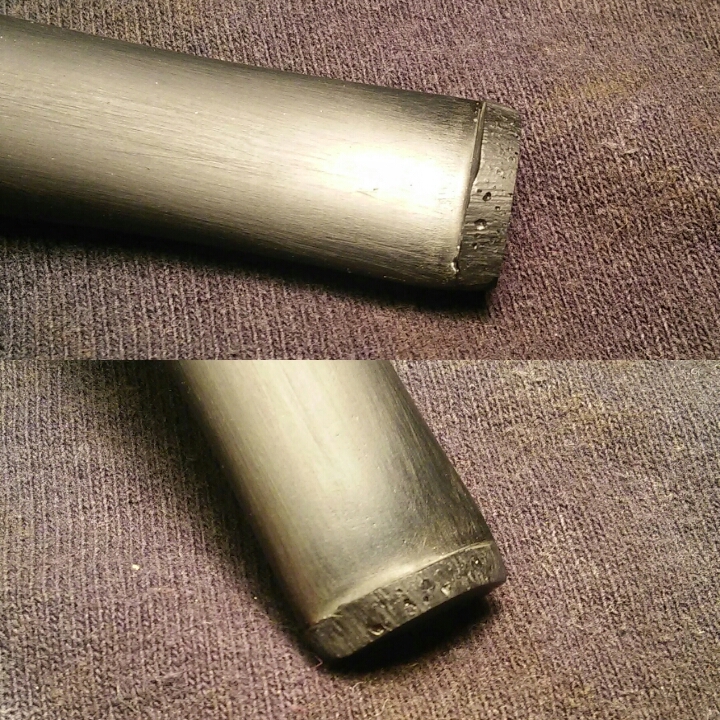 She was in decent shape a little cake, rim char,the button was worn and the biggest problem was the stem logo, it was beyond saving very worn. 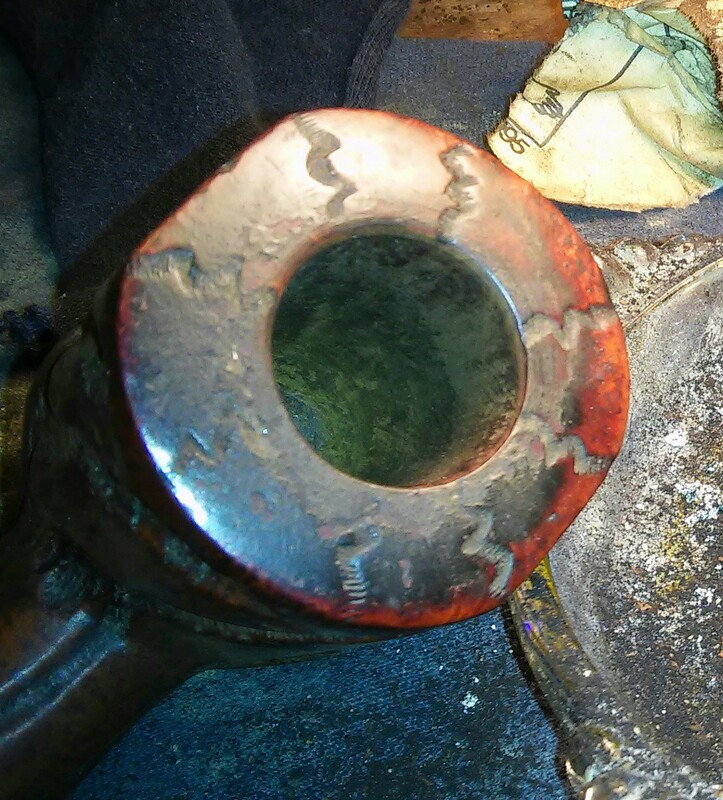 I started with my Castleford Reamer working from the smallest to the largest attachment and in this case the largest was too small. 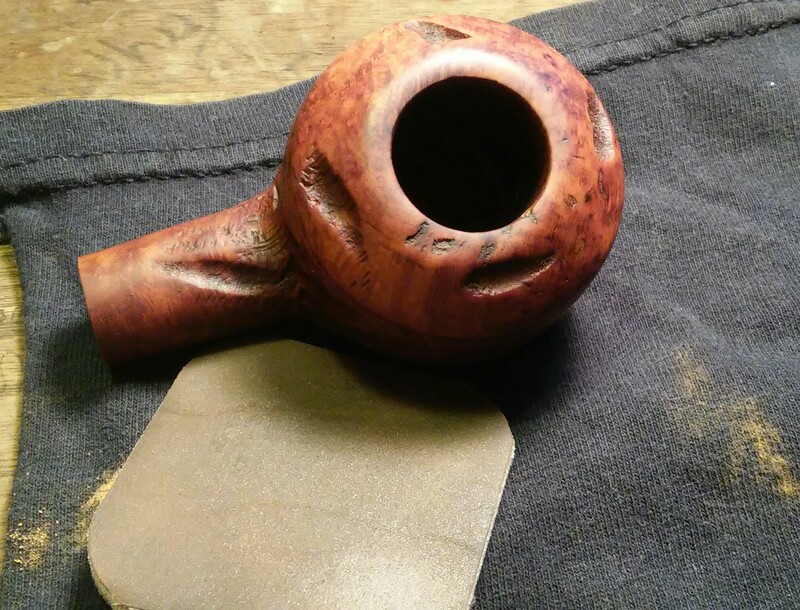 I moved to 250 grit sandpaper so I could take it back to the briar and finished it off with 400 grit paper. 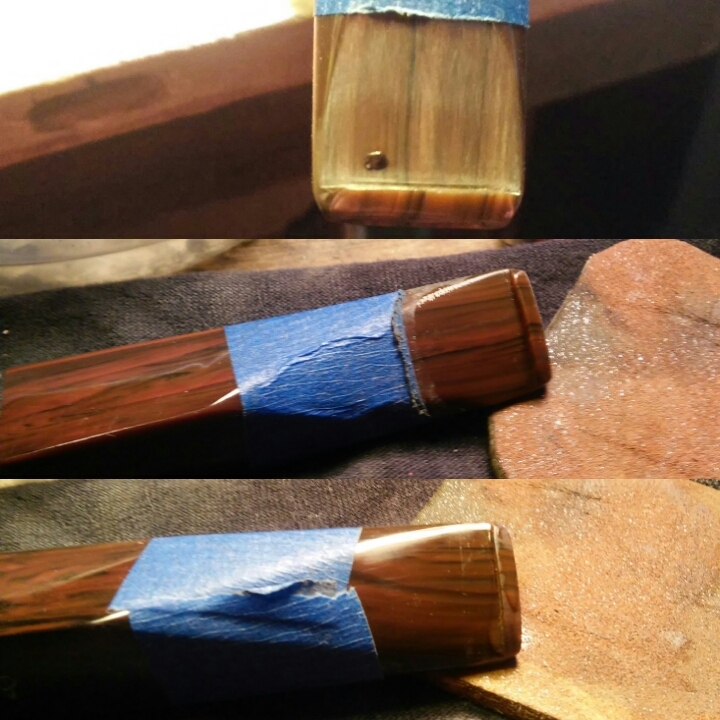 Next the build up on the rim, I applied Method wood for good polish and let it soak in for 10 min . After the 10 min I worked at the area with a children’s toothbrush to break up the tars. I was able to remove the build up but there was still char present . 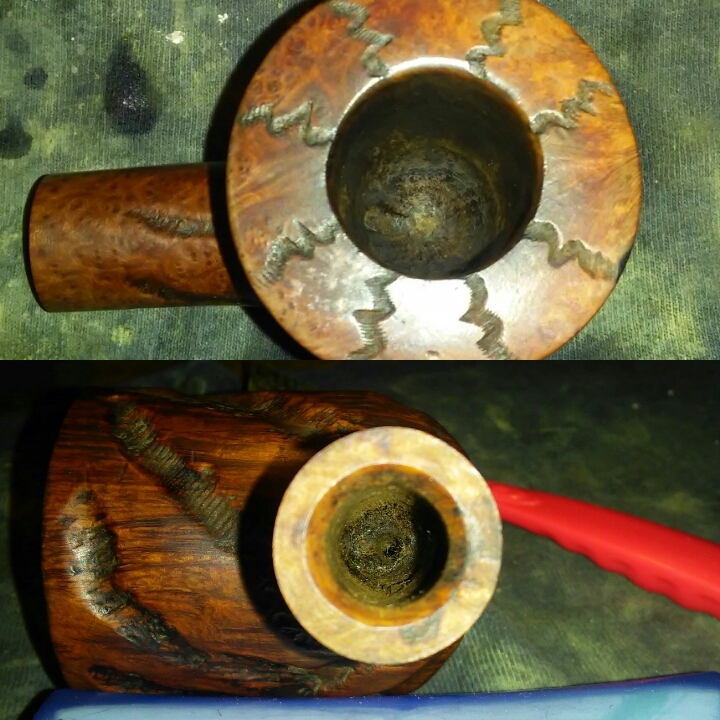 In fear of changing the shape of the bowl I decided to work at it slightly with micro mesh pads to lighten it as much as possible. 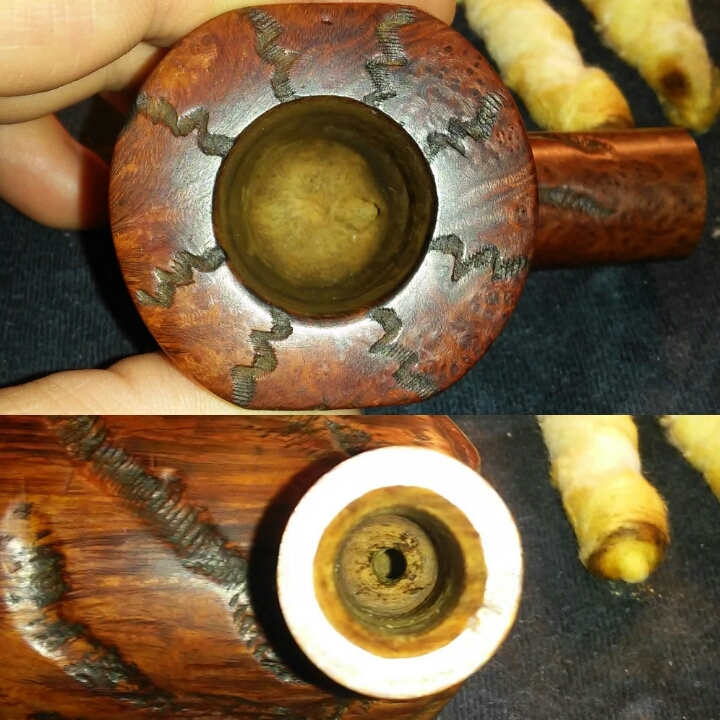 The internals were pretty clean when I received the pipe, I cleaned the mortise and chamber with EverClear, Q-tips, hard/soft pipe cleaners and a shank brush. 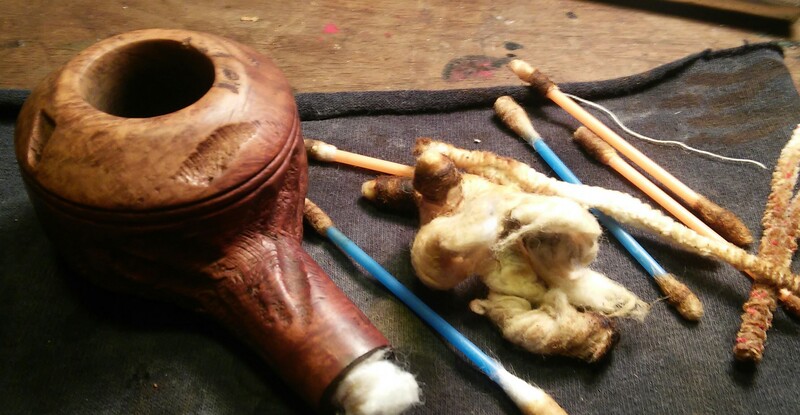 I un-rolled two cotton balls then twisted them together, I then turned them tightly into the mortise . I filled the chamber with a little EverClear and waited for the swab to absorb the alcohol. 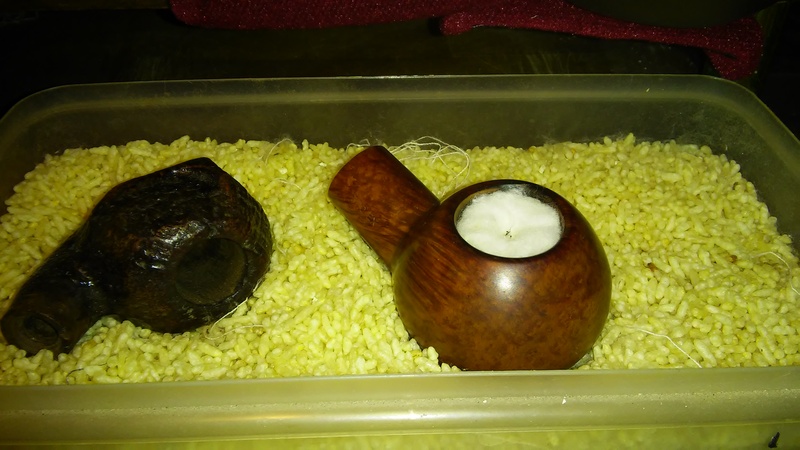 I then placed two cotton balls in the chamber soaked them with EverClear and set the bowl aside to absorb what I missed with my previous cleaning. Next I moved to the stem . 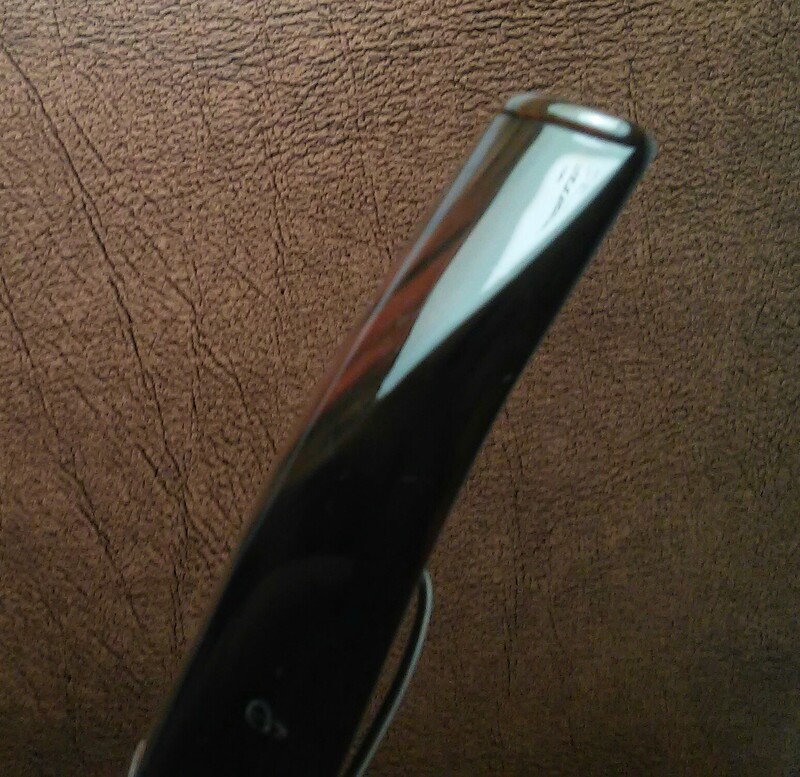 I applied non-bleach Soft Scrub with a children’s toothbrush and worked it into the oxidation. 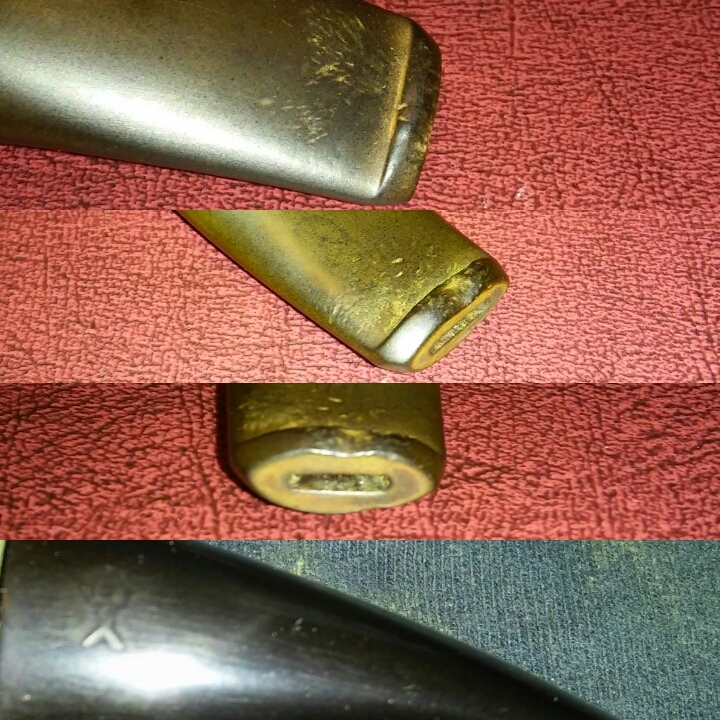 After leaving it for 15 min I used a rag and Magic Eraser and scrubbed until the oxidation was removed. 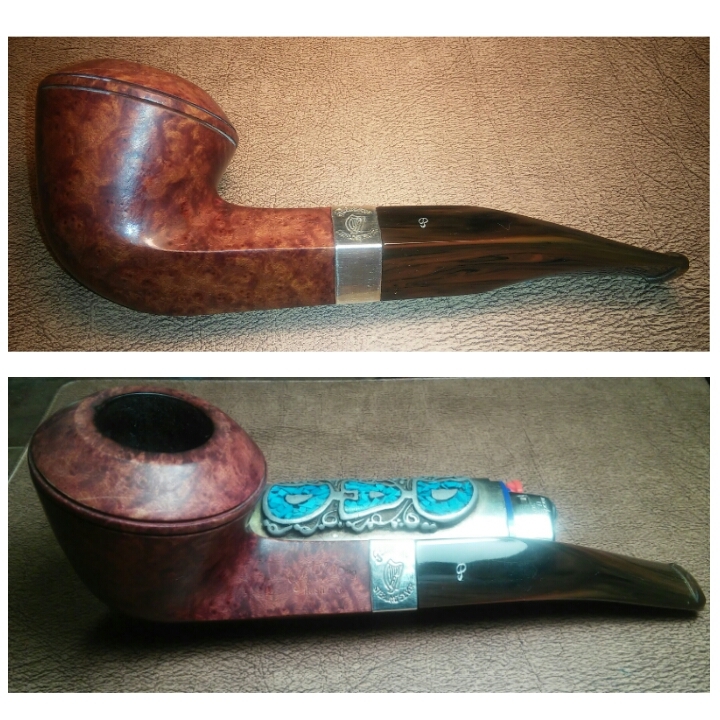 With the oxidation removed I could now address the button. 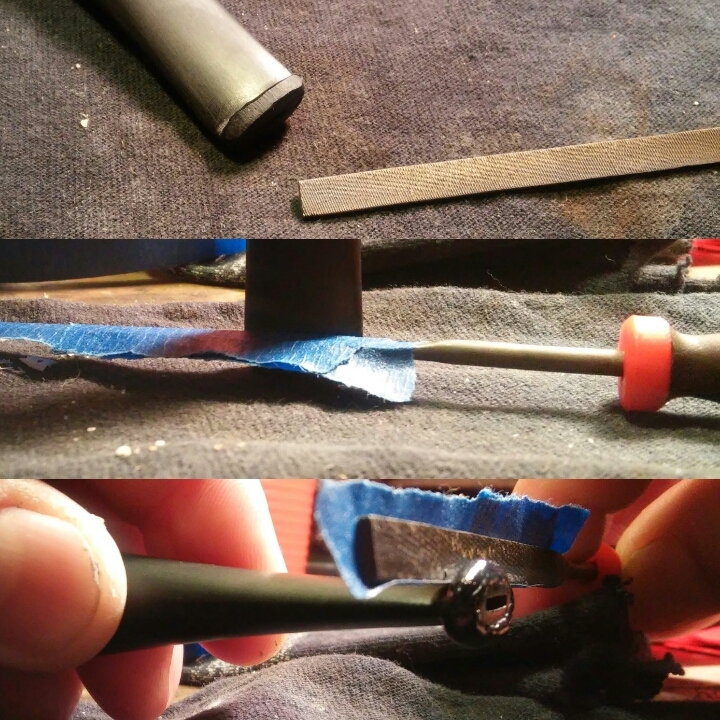 I roughed up the area of the button with 400 grit sandpaper and then cleaned the stem with alcohol. 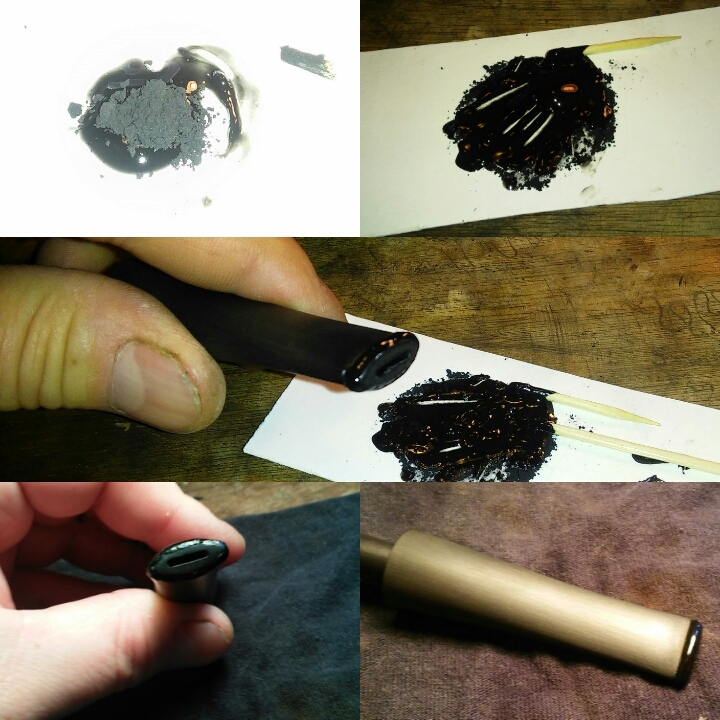 I mixed a paste of thick black CA glue and activated charcoal powder and applied it to the button with a toothpick spreading it evenly across the surface. Happy with the shape I sprayed it with accelerator. With the paste hardened I could form the new button. Using needle files and sandpaper the new button took shape. 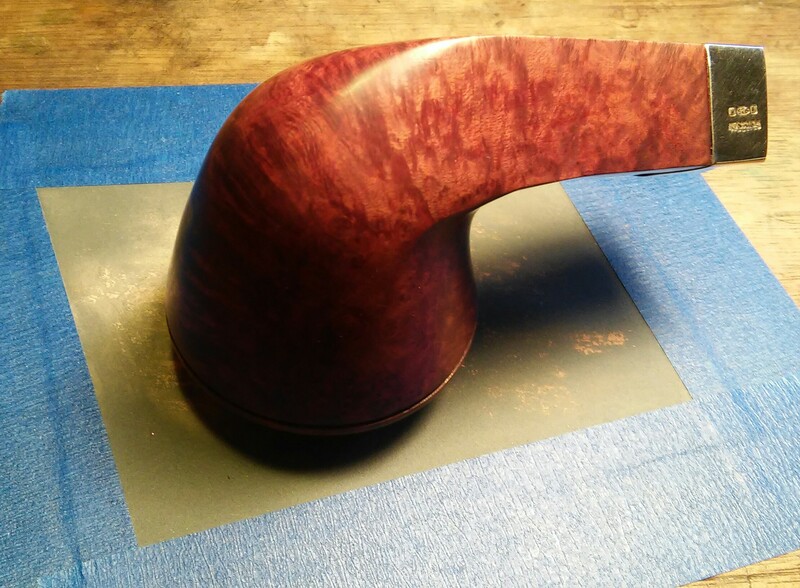 It was now ready for the final sanding. 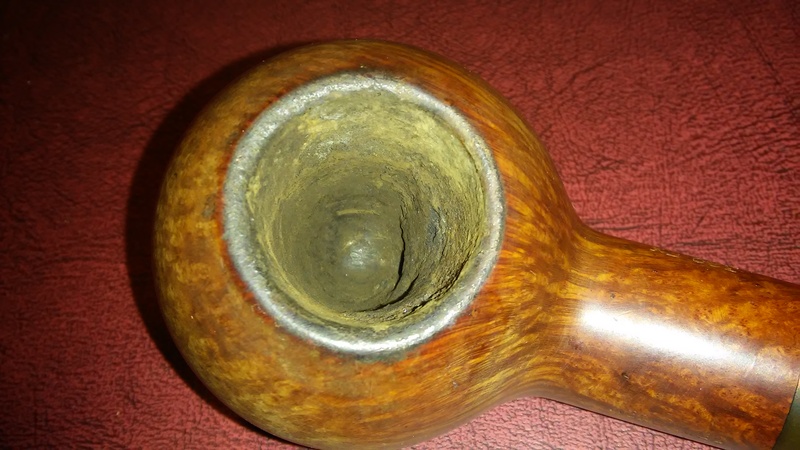 I let the bowl soak for a few hours after removing the cotton balls I could see the chamber was worn. 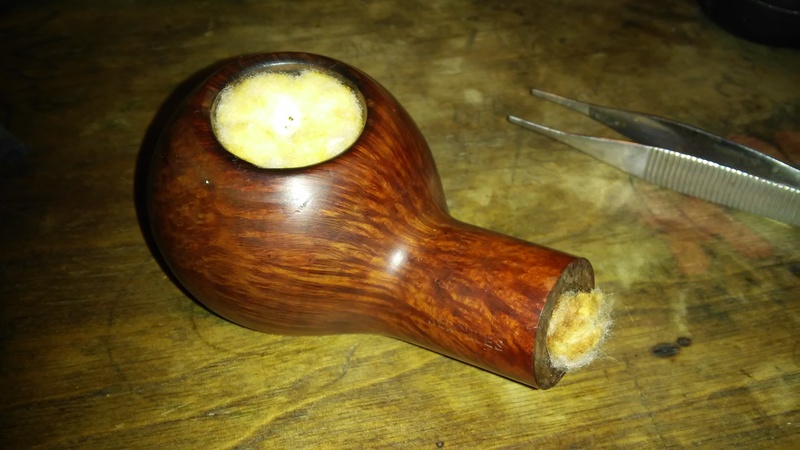 I’ve seen a fellow Pipes Magazine forum member make a bowl coating and thought this was a good time try it. I applied a layer of honey to the chamber then filled it with activated charcoal I let it sit for 15 min then dumped the excess and I then left it for a week. 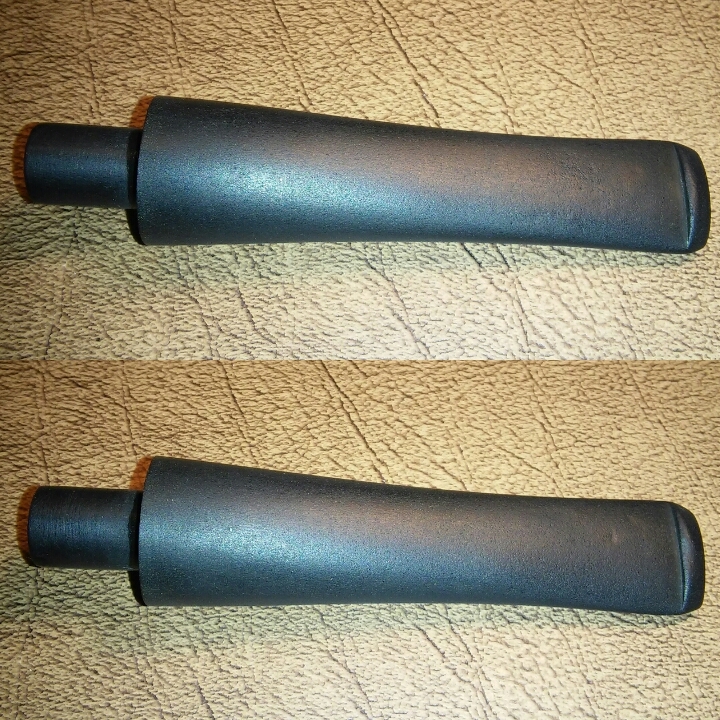 After a week the coating hardened. 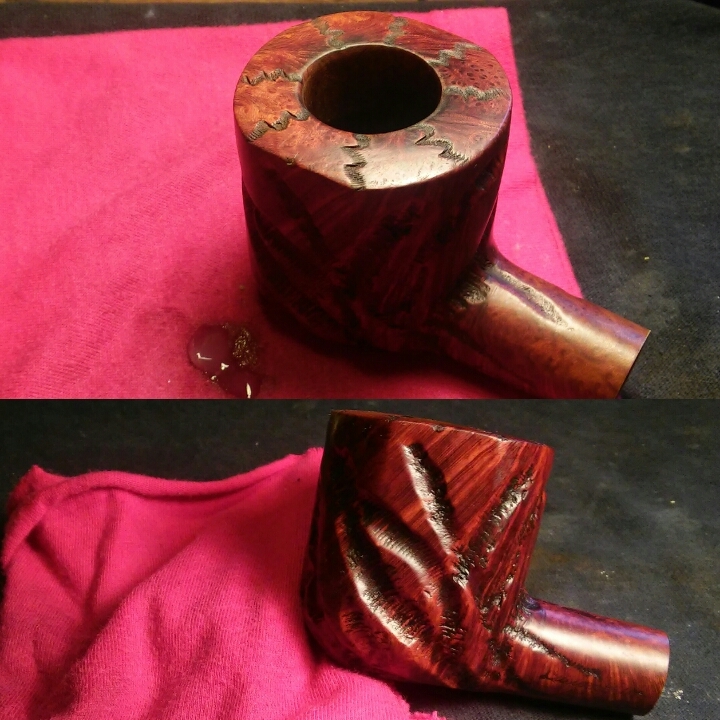 After the bowl coating cured I could begin work on the stem. I tapped off what was left of the logo and then began sanding with 1000 grit sandpaper then working through the various grits of micro mesh pads to bring back the shine. Now onto the buffer. Finished her up with white diamond, a few coats of carnauba and a micro fiber hand buffing. One More For The Case. 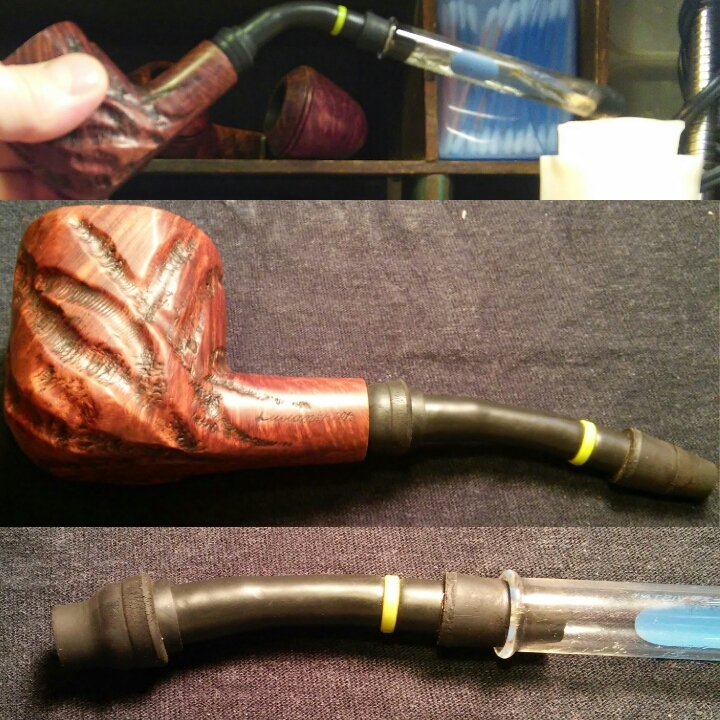 My ever-growing collection of Custom-Bilt pipes, it has indeed outgrown it’s display case. 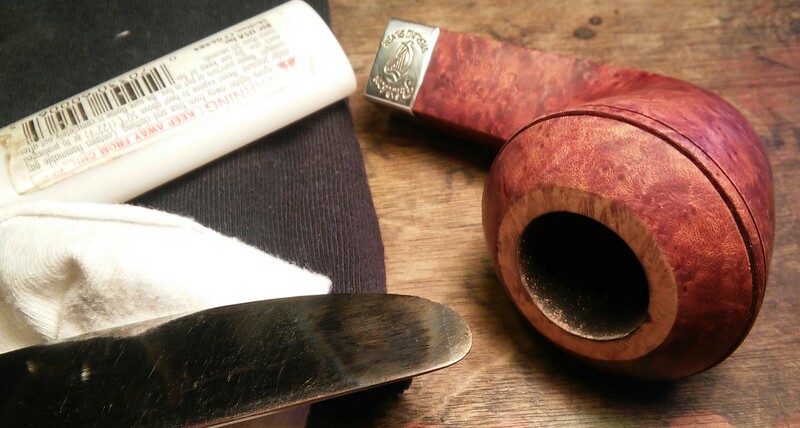 Originally meant to house my small Tom Howard and Custom-Bilt collection has turned into an overflowing collection of Custom-Bilt pipes alone. 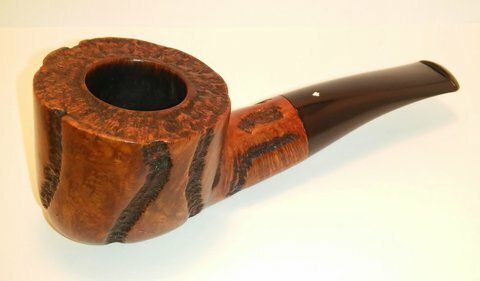 Before my knowledge of the company and it’s founder Tracy Mincer, I was intrigued by these large and ugly pieces of briar. They seemed like misfits in a sea of smooth,small and manicured pipes of it’s time. 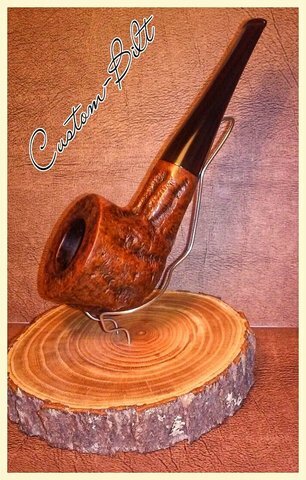 Custombilt pipes are not all created equally which I soon found out. 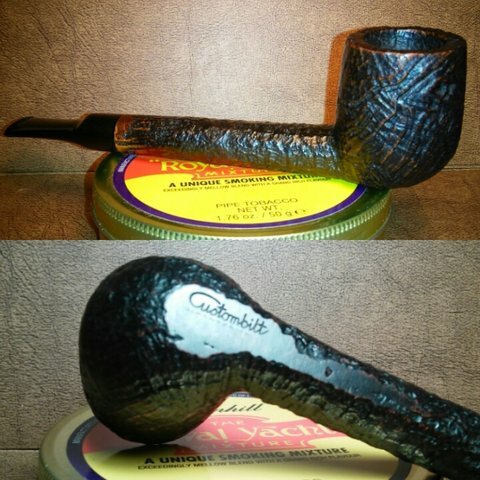 My first Custom-Bilt purchase three years ago was more of an accident, an older woman the owner of an antique shop in Troy N.Y. had listed a pipe in her EBay shop, poor photos and little information let it slip by unnoticed , I decided to pull the trigger. 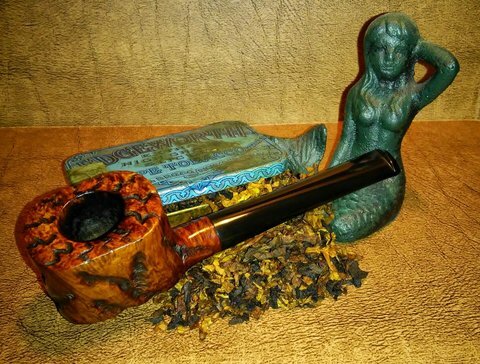 I was surprised upon receiving the pipe it was big, bulky and roughly carved but comfortable in the hand. 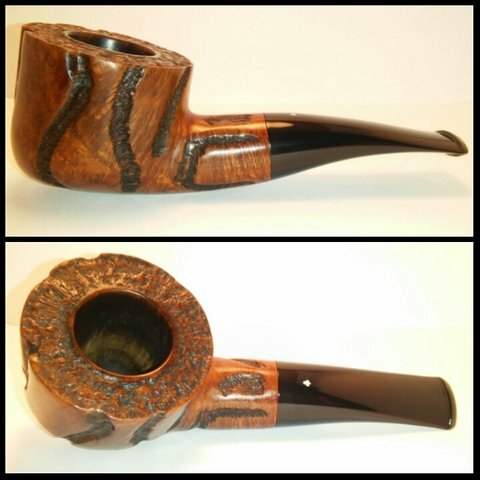 On the underside of the pipe was the words Imported Briar and Custom-Bilt I instantly fell in love with the pipe. Now the research began, I found the company founder was Tracy Mincer and the name Custombilt later changed hands multiple times and with the change of hands came the change in quality. I own only a couple of the un-hyphenated examples there rustication and use of filler is unappealing to my eye. 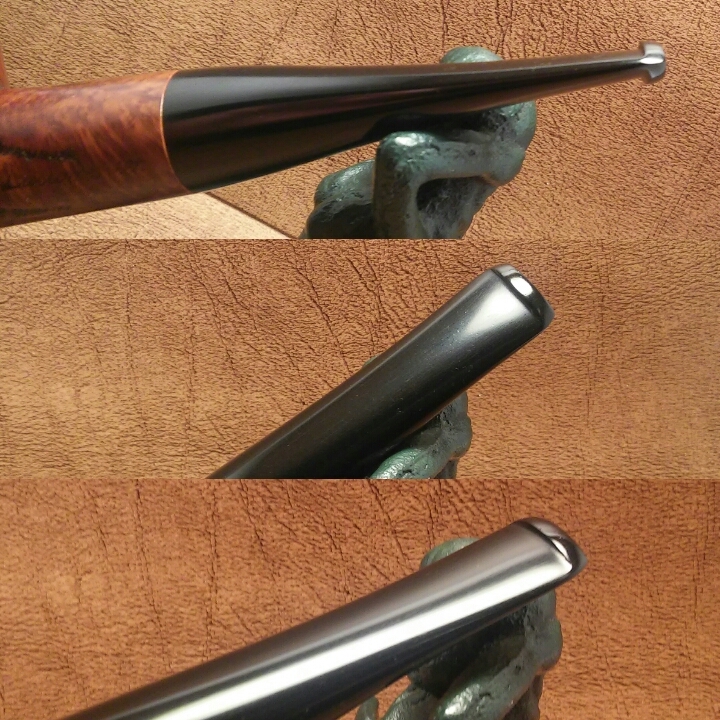 My focus is on the Mincer era 1934-1946 pipes (Custom-Bilt)I have found zero filler in these. 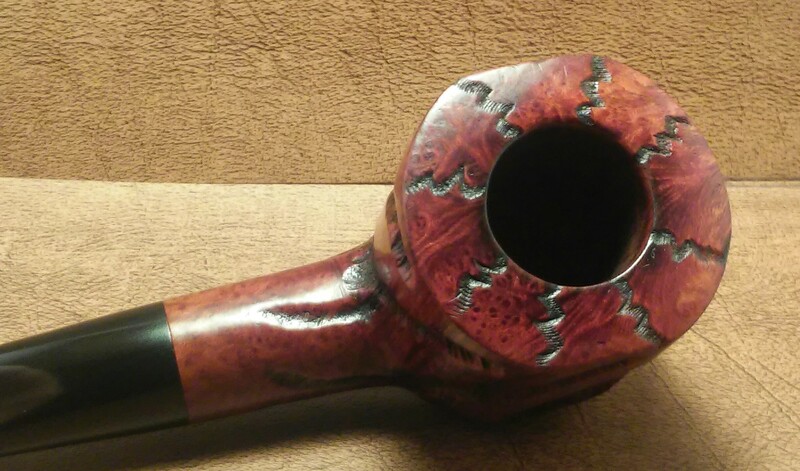 Last month thanks to my wife and Jeff of the NASPC I received a copy of Bill Ungers book- As Individual as a Thumbprint: The Custom-Bilt Pipe Story. A whole new world opened, the information in Bills research and writings is priceless to a collector. I now know much more then I did three years ago. 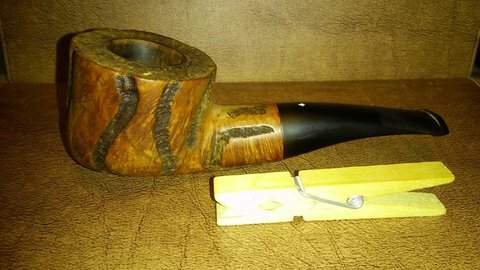 My latest purchase via EBay is no different thick, bulky and beautiful with the exception of a small rubber filter insert which I have two others in my collection one with it’s insert and one without. I have become addicted to finding these oddities, the filter inserts were usually misplaced or simply tossed but this one is complete. 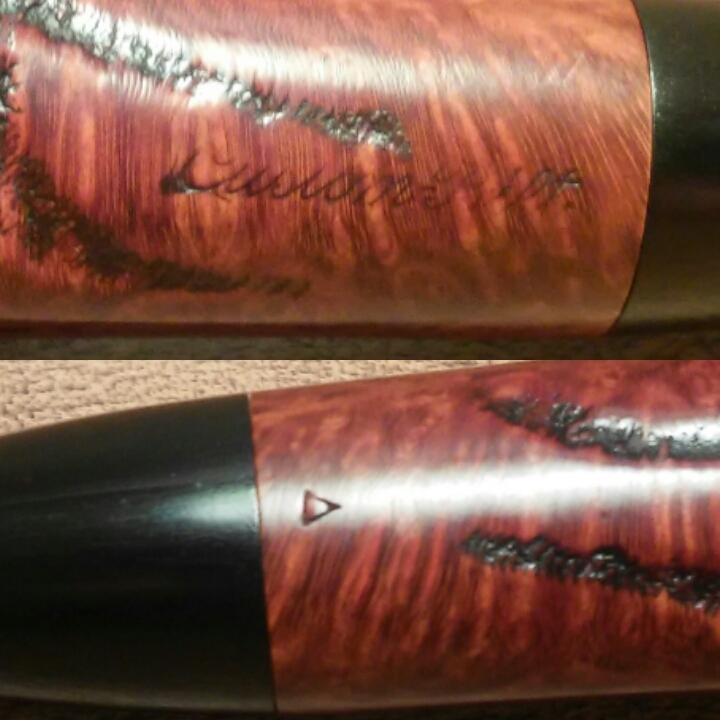 Custom-bilt was stamped on the left side, on the right side a triangle and there was no evidence of Imported Briar having been stamped anywhere . The same is true with the two others in my collection. 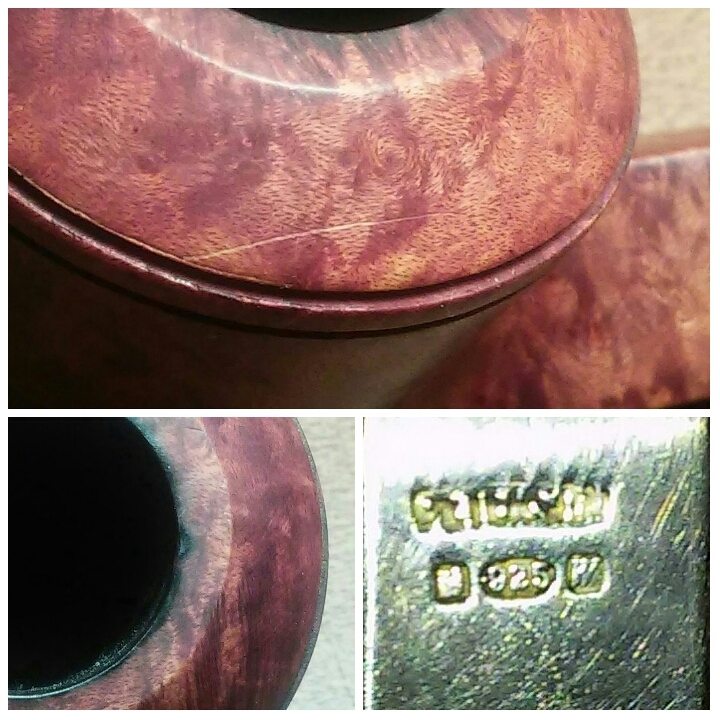 Custom-Bilt was lightly stamped or worn over time. 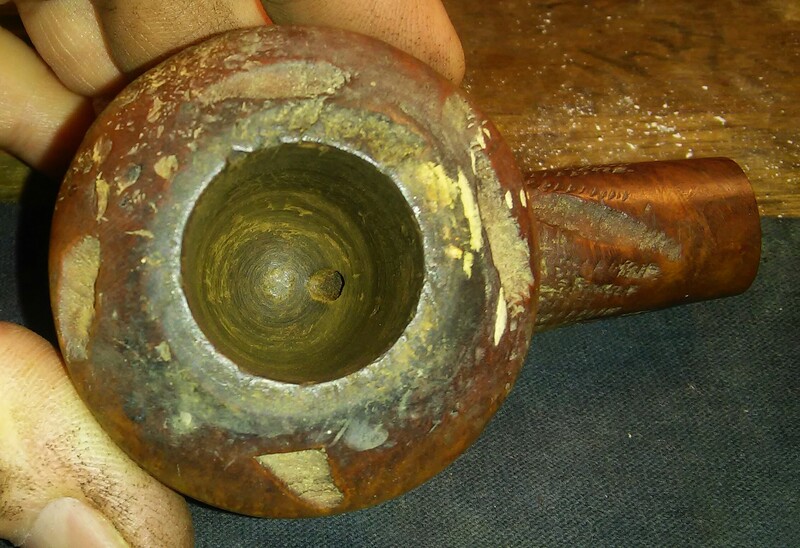 From my experience it’s common in Pre-1946 pipes. 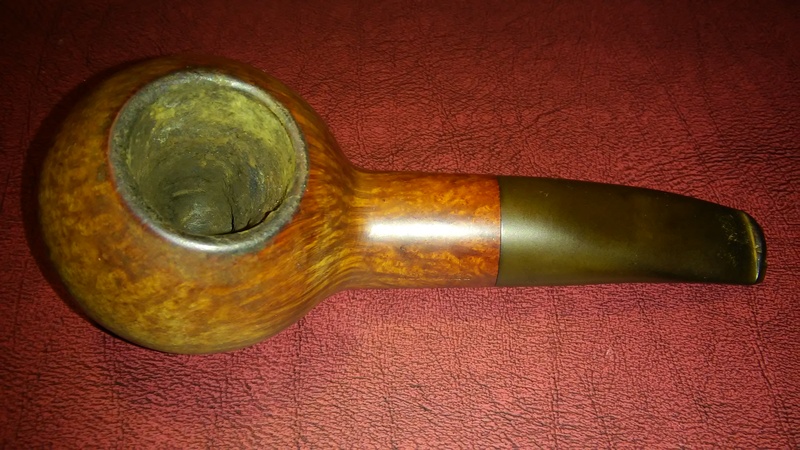 It appeared untouched by someone like myself which is always a good start ,it seems everyone on EBay is refurbishing now and not always for the good of the pipe . 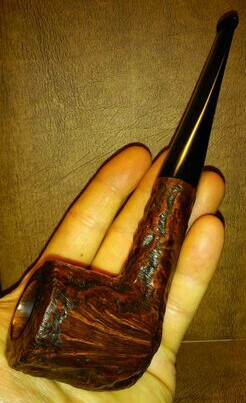 Overall she was in good shape upon receiving, a bit of fossilized cake, build up around the rim and only faint chatter/ oxidation on the stem. The button was worn and would need attention as well. Now the fun could begin. 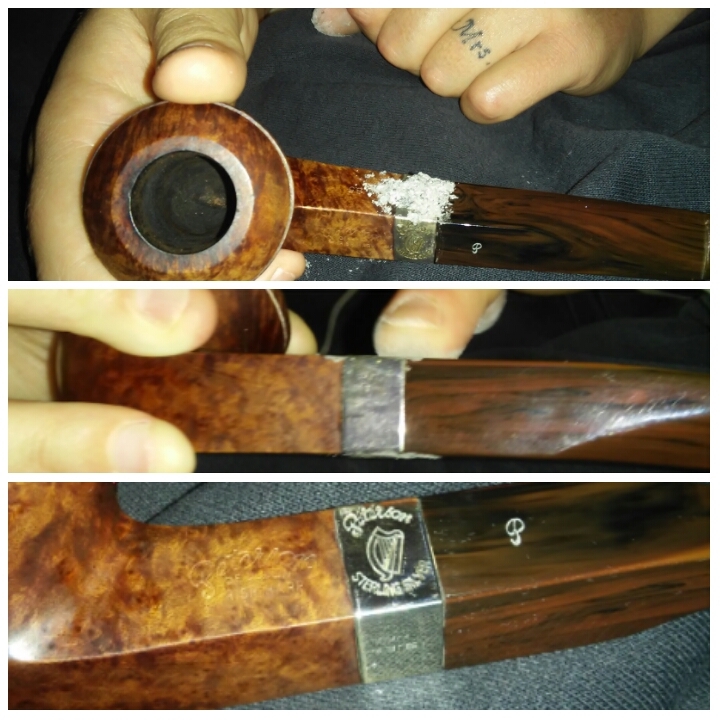 After looking over and disassembling the pipe I set aside the stem to come back to later. 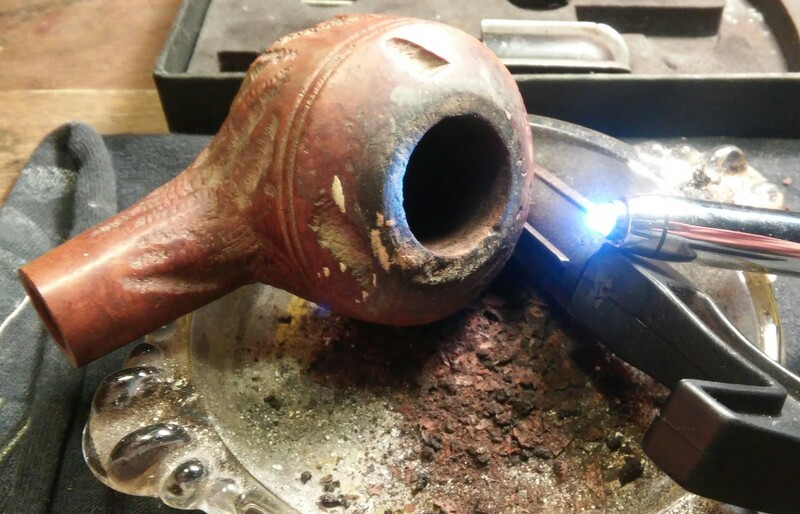 I started with the bowls chamber and my Castleford reamer , beginning with the smallest reamer always keeping it centered and working up to the largest that the chamber would accept,in this case it would accept the largest. 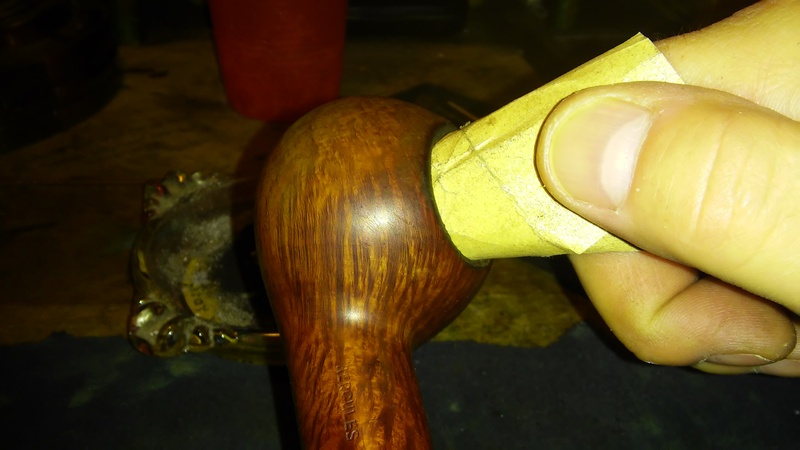 Finishing up with 400 grit sandpaper wrapped around a finger. 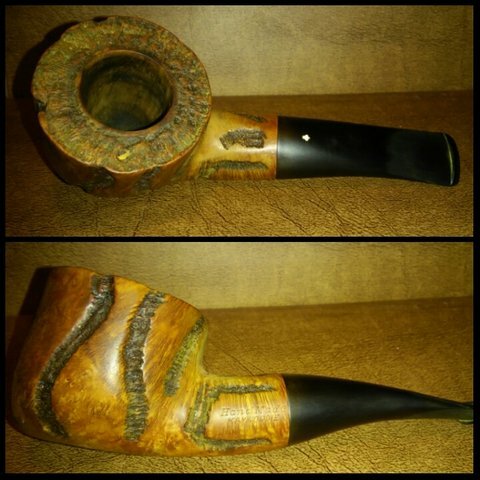 I always take my estates back to briar to be able to see the start of a burn out/damage , the chamber was free of burning or cracks. Next my attention turned to the caked rim. 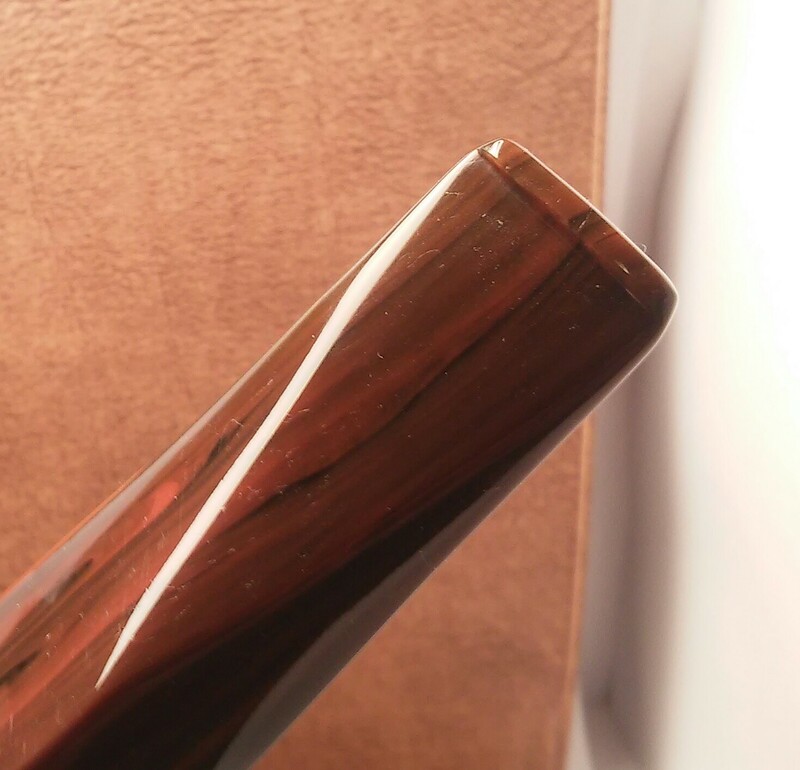 I started by applying a generous amount of Method wood for good polish with a Q-tip and letting it penetrate the build up . I let it sit from 15min/30min depending on the severity. After letting it penetrate I used a children’s toothbrush to break up some of the tars. Next I used makeup pads, Q-tips, the toothbrush and kept working at the area until the build up was removed. 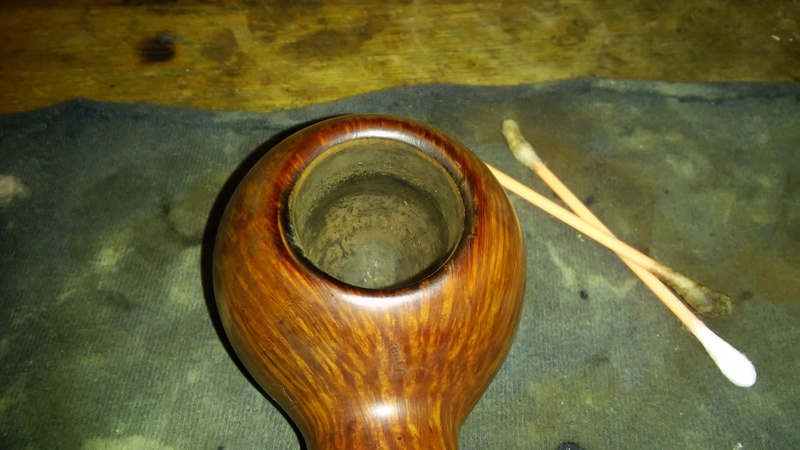 At this time I cleaned the exterior of the bowl with the wood polish ,toothbrush and Q-tips as well. Next the internals. 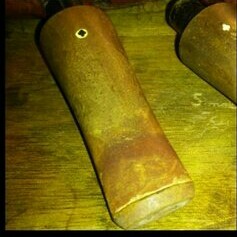 The draft and mortise were plugged with tars and old tobacco. It would need to be cleared before receiving a retort. Using a pick set, shank brushes, stiff bristle pipe cleaners ,Q-tips and EverClear I cleared the blocked airway. 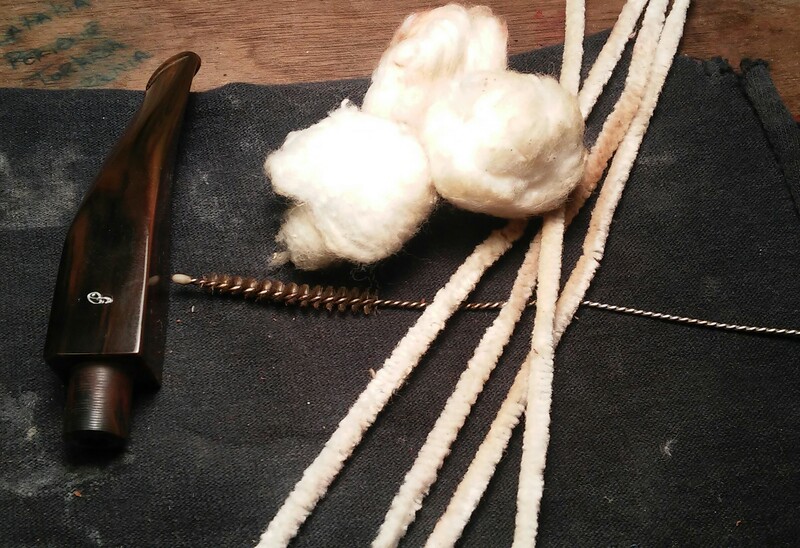 Next I unrolled cotton balls and then twisted them together to form a long cotton swab. 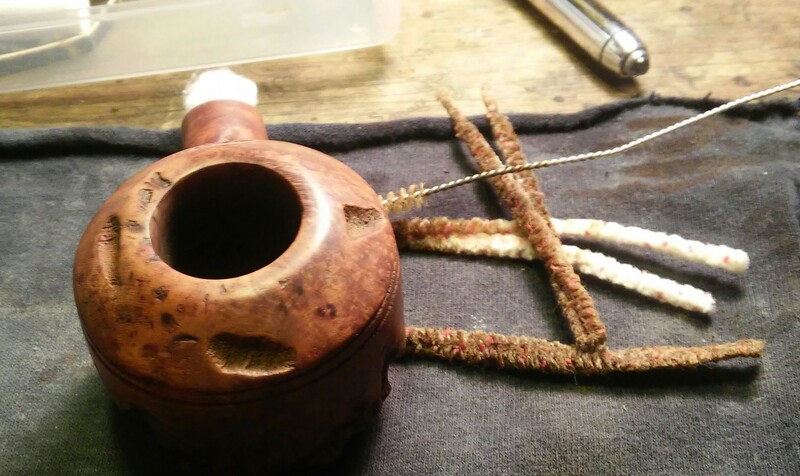 Using the twisted cotton swab I turned it into the mortise tightly. I then filled the chamber with a little EverClear and waited for the swab to absorb the alcohol. Then I filled the chamber with three cotton balls and soaked them with EverClear. I would set the bowl aside to let the alcohol and cotton balls absorb the leftover tars/ghosting. 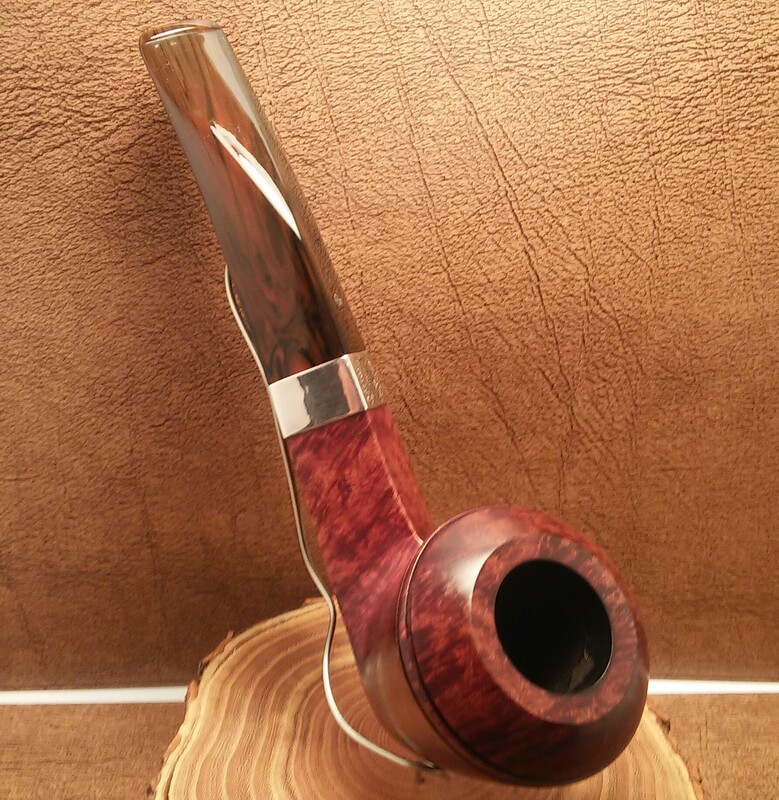 With the bowl set aside I moved on to the stem. 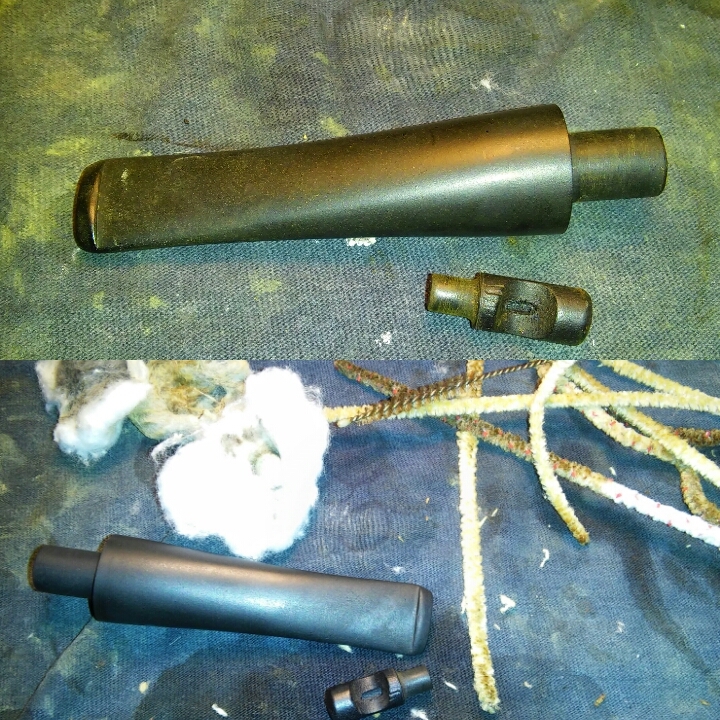 I Cleaned the interior and exterior using EverClear, cotton balls, small shank brush and stiff/soft pipe cleaners. 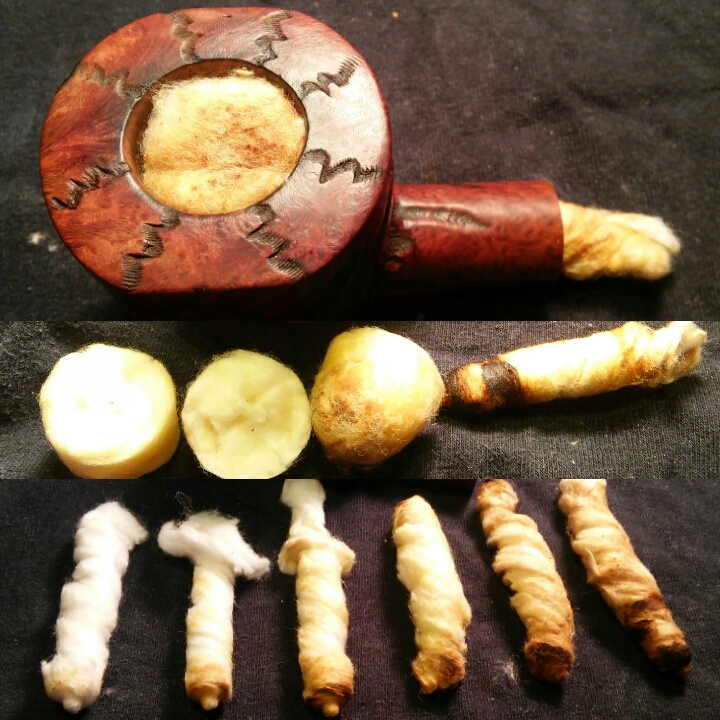 I worked the interior until the pipe cleaners came out as they when in. 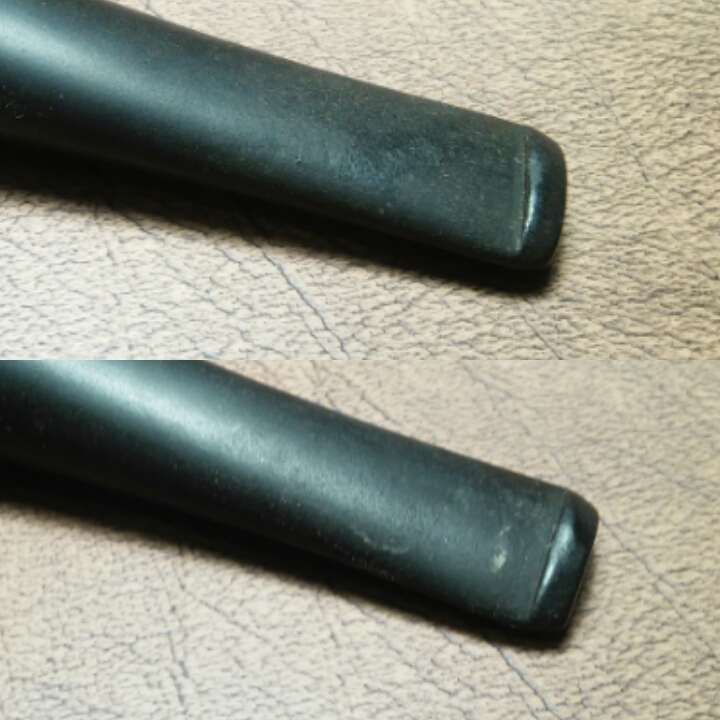 It appeared that the filter end at one point was removed using pliers there were deep grooves imbedded in the rubber. 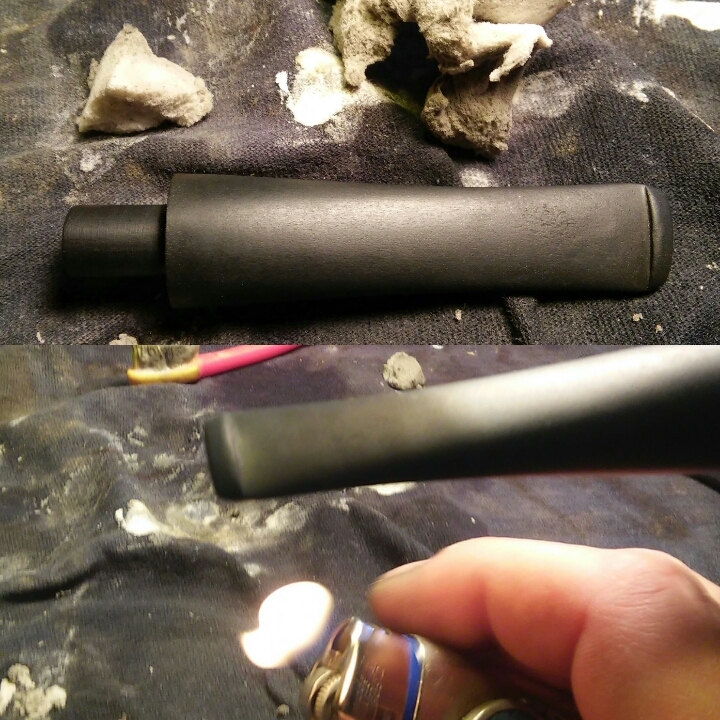 Using a Bic lighter I carefully heated the area until the indentations were all but gone. I will finish it up later on with micro mesh. 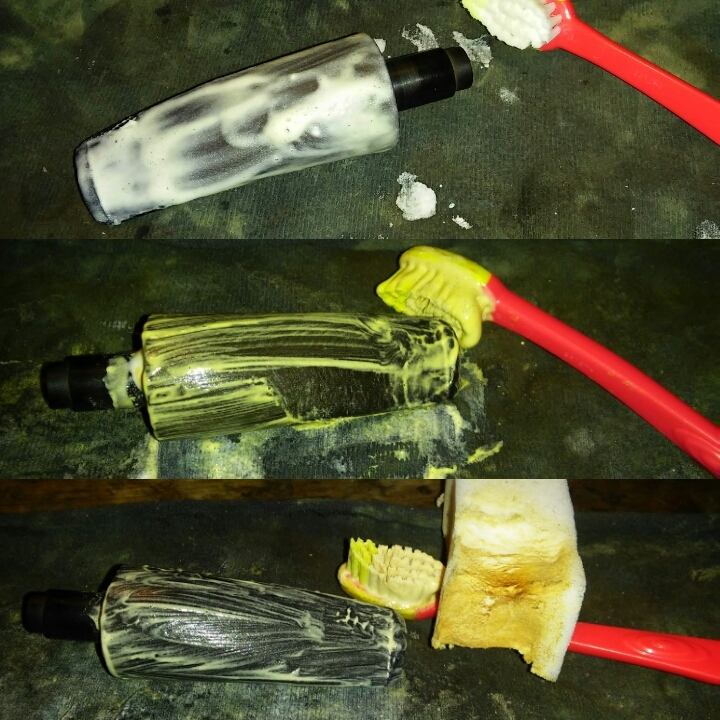 Using a children’s toothbrush I applied non-bleach Soft Scrub and let set for 10min as it soaks into the oxidation the Soft Scrub turns from white to a brown color. Now comes the elbow grease. 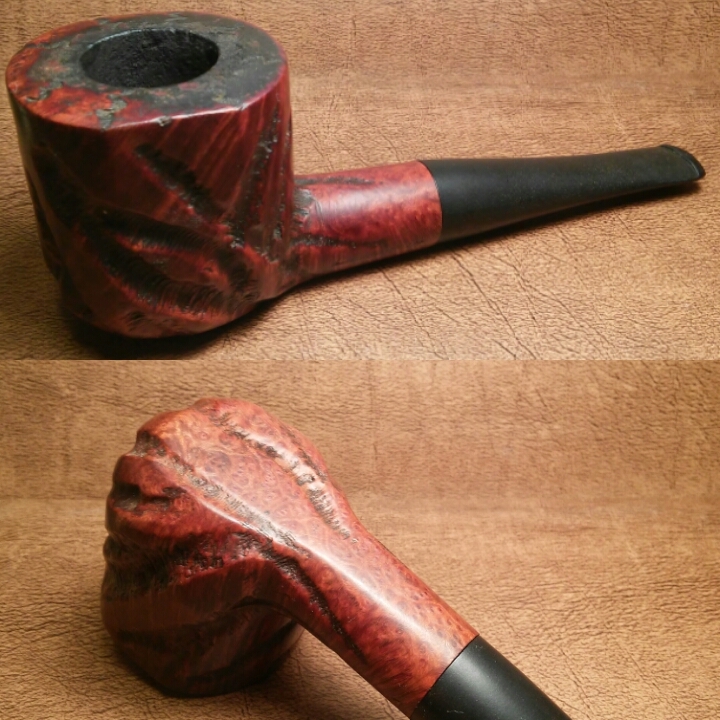 After the Soft Scrub had time to work into the oxidation, I scrubbed the stem with a Magic Eraser and a rag until the oxidation was removed. 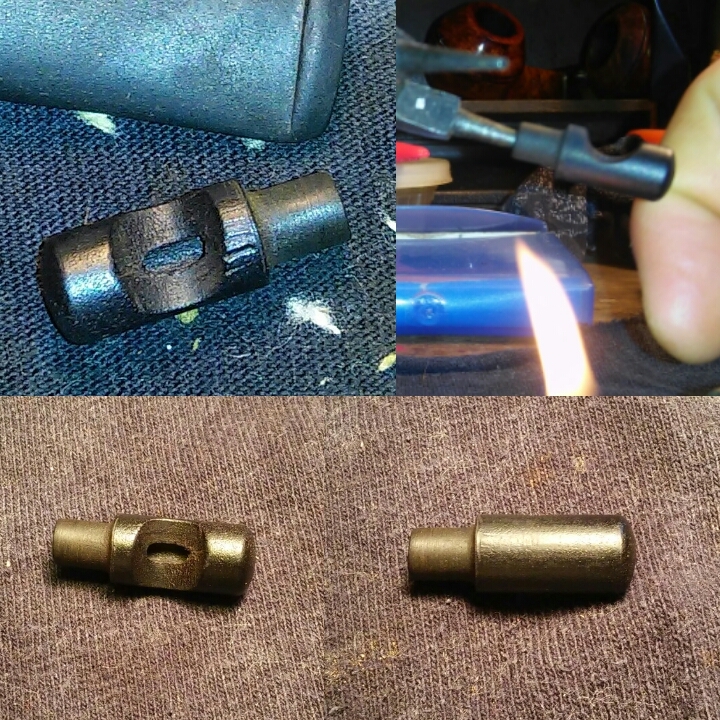 I then heated the stem with a bic lighter (moving the heat source at all times never leaving it in one area too long) at the bit/lip area to raise some of the tooth impressions (I also use a heat gun) . 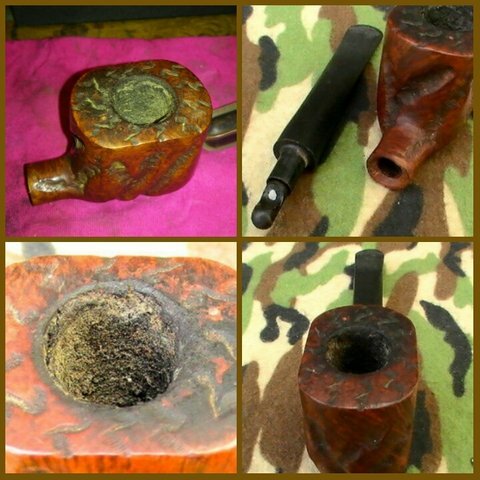 After the Soft Scrub and heat the stem was left with a rough surface, some of the impressions had risen but the button would still need work. 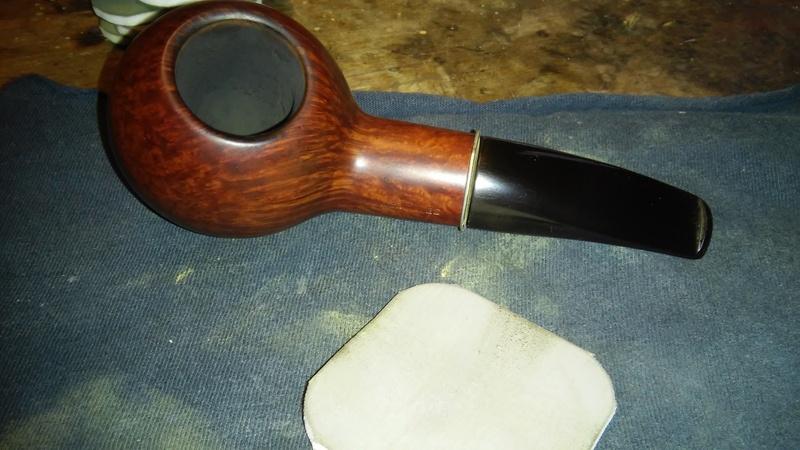 After sanding I wiped down the stem with alcohol. 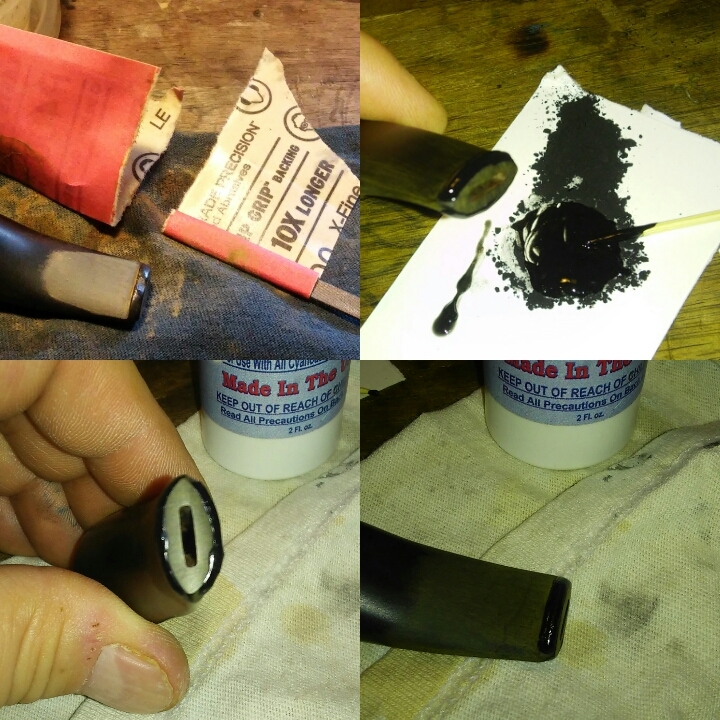 I then made a paste by mixing thick black CA glue and activated charcoal powder. With a toothpick I applied the paste to the button trying to keep it as even as possible. 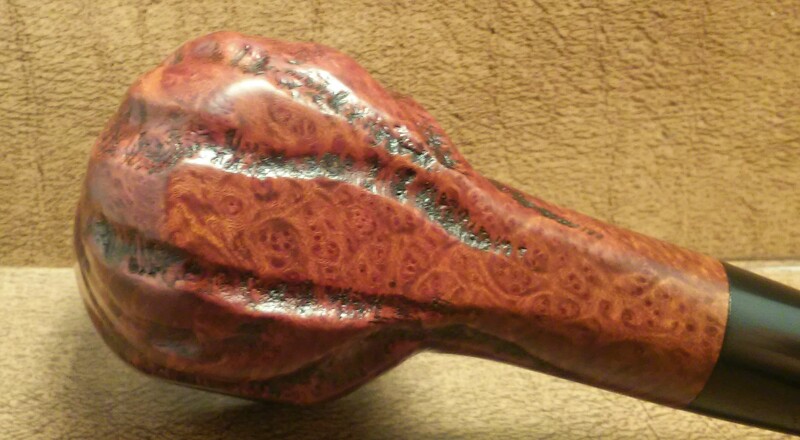 Once I was happy with the shape I sprayed it with accelerator. With the paste now hardened I used a needle file to begin forming a new button. I tapped the underside of the file so I could get the file flush against the button to form a sharp edge without cutting into the bit. 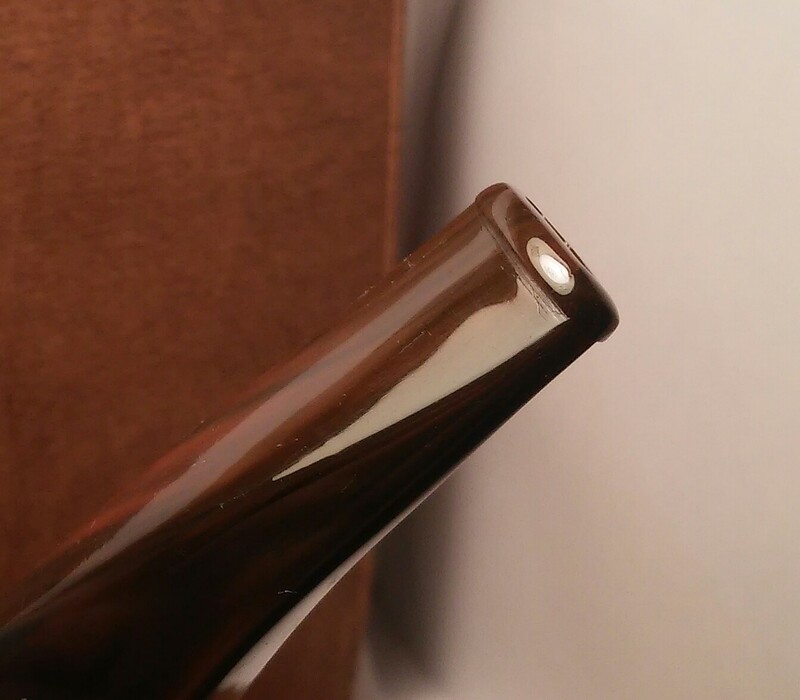 As I began removing the surface of the new button I uncovered holes where bubbles had formed. The process of mixing the paste and applying it would have to be repeated. 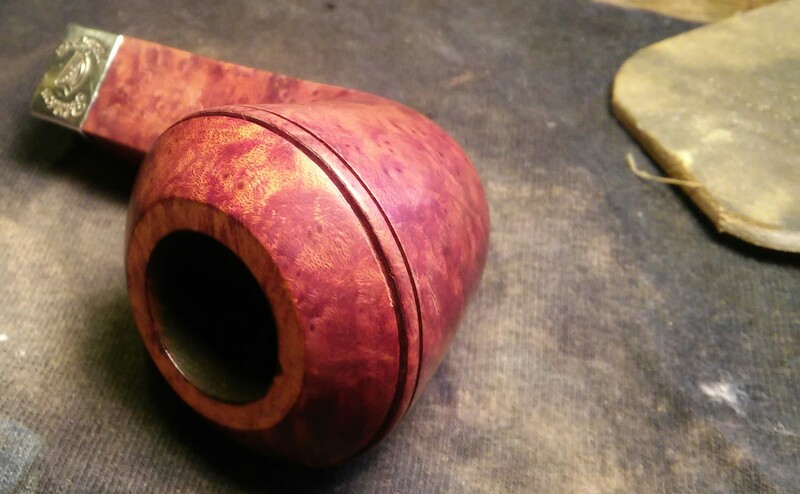 After reworking the button and finding a suitable thickness I moved onto the stem itself . Wet sanding with 1000 grit sandpaper then moving through the various grits of micro mesh. Now it was ready for the buffer. 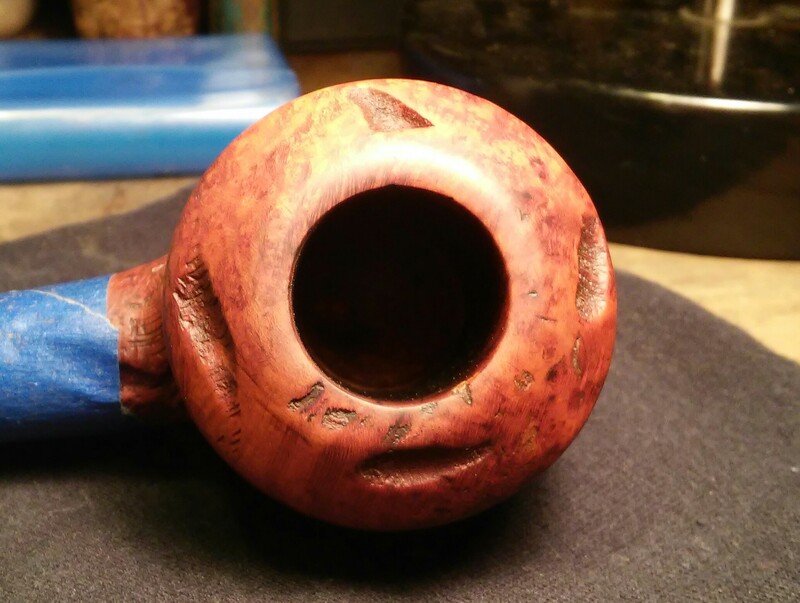 I allowed the bowl to soak for a few hours. The chamber looked good but I would repeat the process on the mortise several times until the cotton swabs came out clean. The chamber and mortise were free of the visual residue but the ghost still remained . The previous piper was a fan of aros. I ran it through a retort to remove the ghosting . 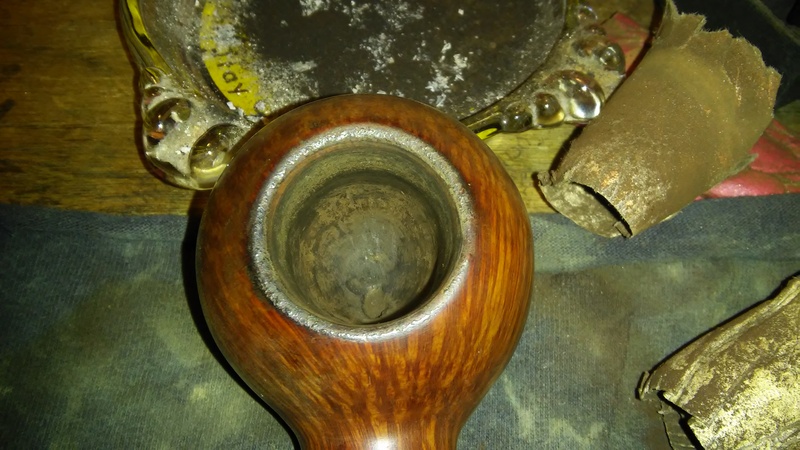 I have adapted my retort to fit the bowl alone, there was no need to include the stem as my previous cleaning removed the ghosting from it. This also comes in handy with stems that maybe damaged by the alcohol. 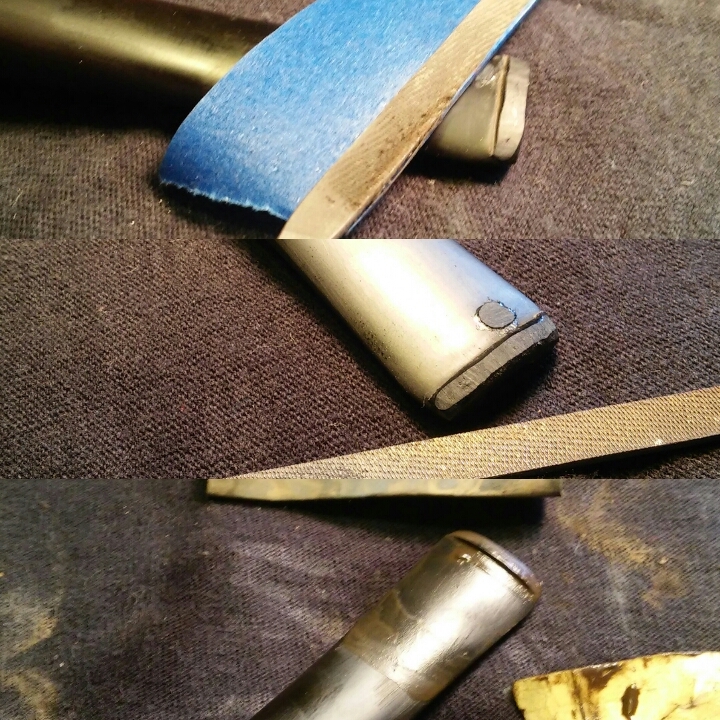 The rim was darker towards the shank ,I used a worn micro mesh pad to remove some of the darkening. 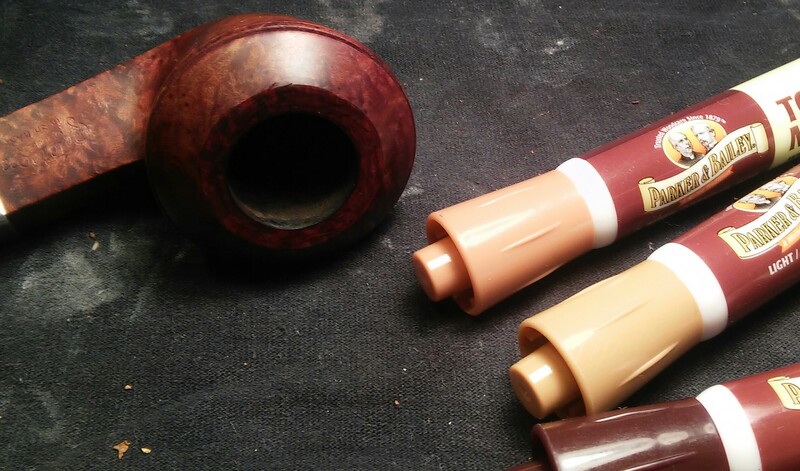 With all my Custombilt, BP Jum, Marxman and Tom Howard pipes I apply a small amount of Howard’s butcher block conditioner. 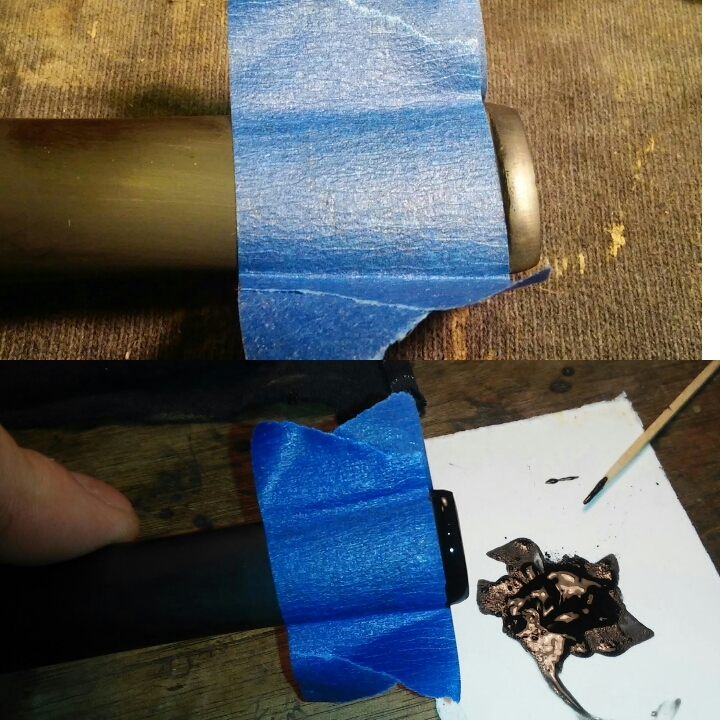 I work it into the deep grooves and the pipe itself with a rag and let it soak in for a few minutes.I remove the excess with a clean rag and give it a quick hand buff. 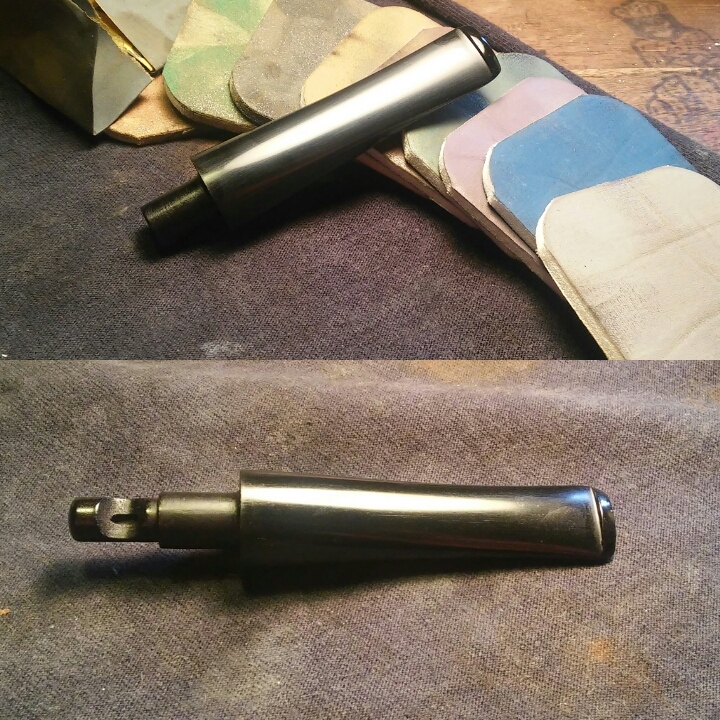 It was now off to my makeshift buffer, a hand drill clamped in a drill press vice with a drill mounted buffing kit. My original bench buffer burnt out three years ago,out of necessity I came up with this, the results met my expectations. I started with white diamond, than a few coats of carnauba and finishing up with a micro fiber hand buffing.